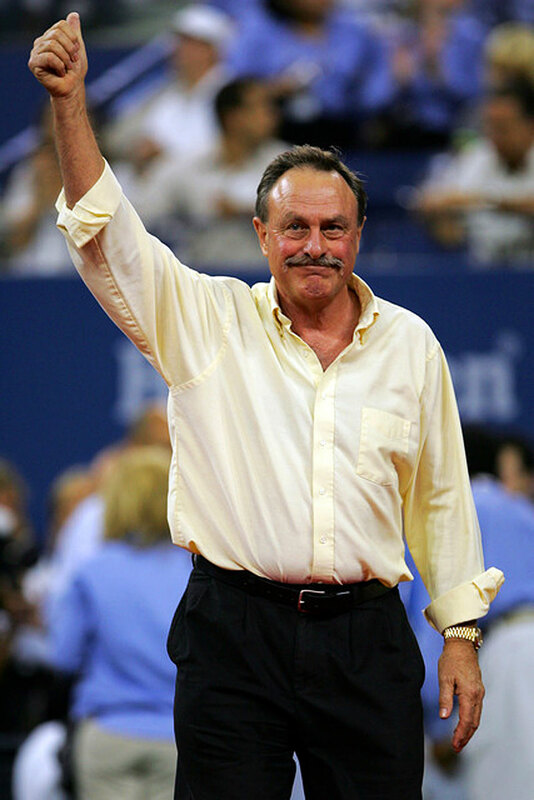 The U.S. Open Tennis Tournament finals are coming-up this weekend, so I thought it would make sense to explore one of the greatest tennis players in history. 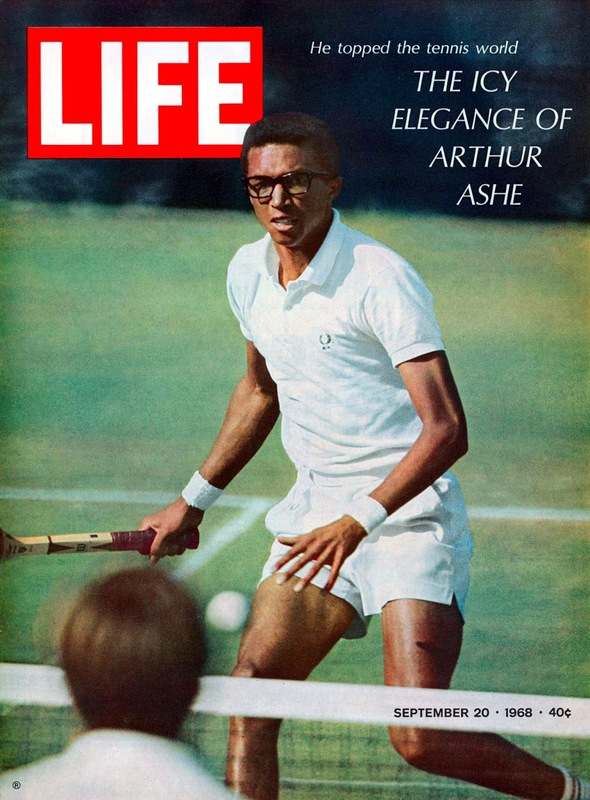 This years U.S. Open represented the 48th anniversary of Arthur Ashe, in 1968, becoming the first African American man to win a major singles tennis title. At the time Arthur Ashe was a lieutenant in the U.S. Army, as well as being an amateur tennis player. Arthur Ashe is one of the greatest tennis players in history, and the only African American player to ever win the men's singles at Wimbledon, the U.S. Open, and the Australian Open. Arthur is pictured below sporting his yellow gold Rolex Day-Date. 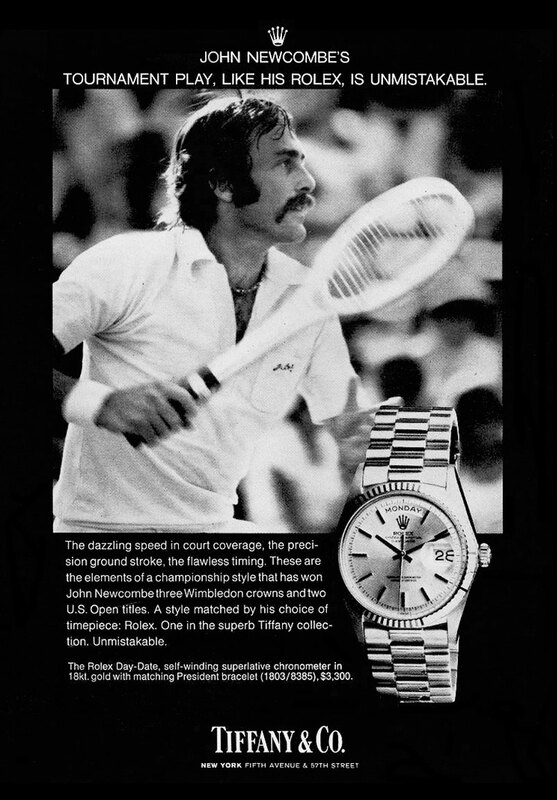 It is amazing how timeless and evergreen Rolex watches are, especially when you realize this photo was taken 43 years ago, in 1970, at the Queen's Club in London. 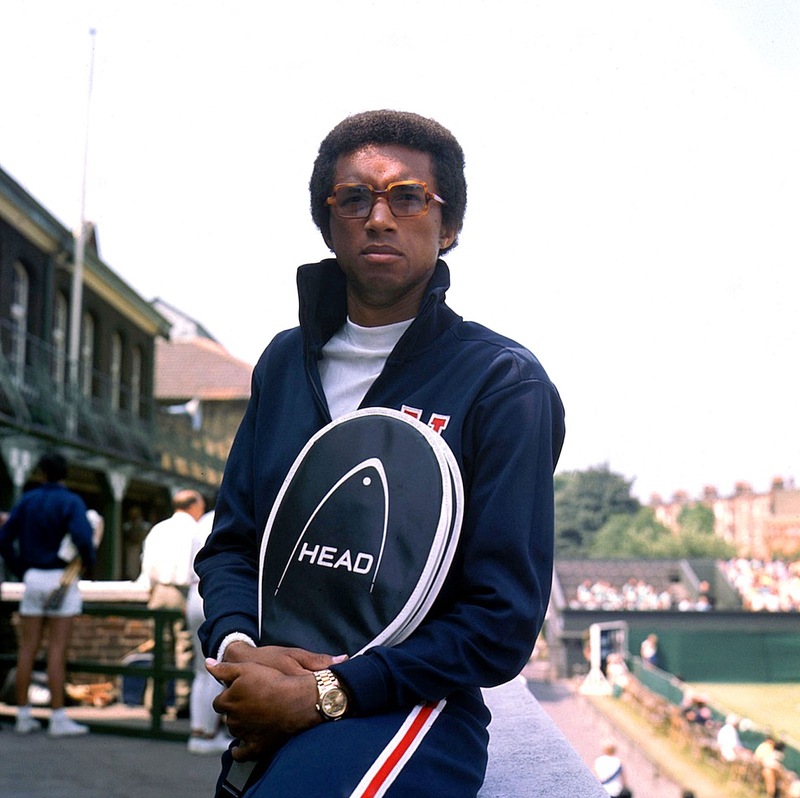 Arthur Ashe is the first black man in history to wear a Rolex President (Day-Date). 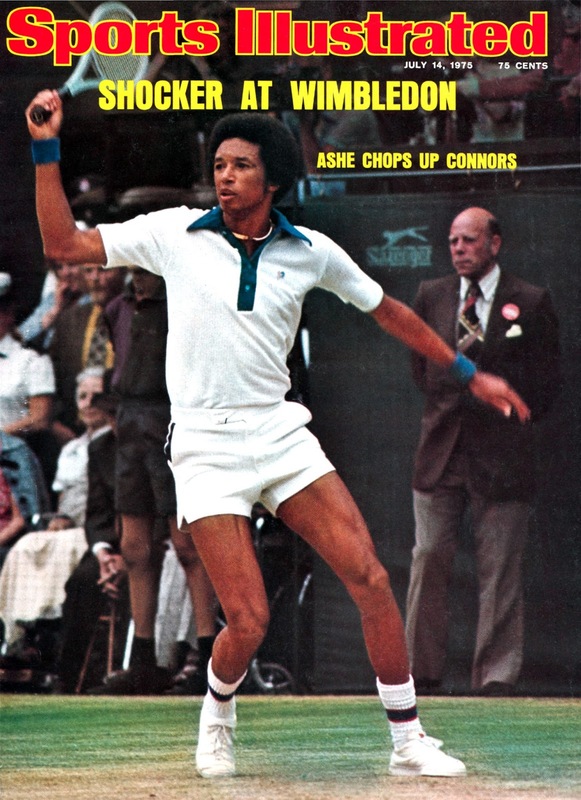 I know Bill Cosby wore many Rolex Day-Dates and so did Pele, but I believe Arthur Ashe was the likely the first. 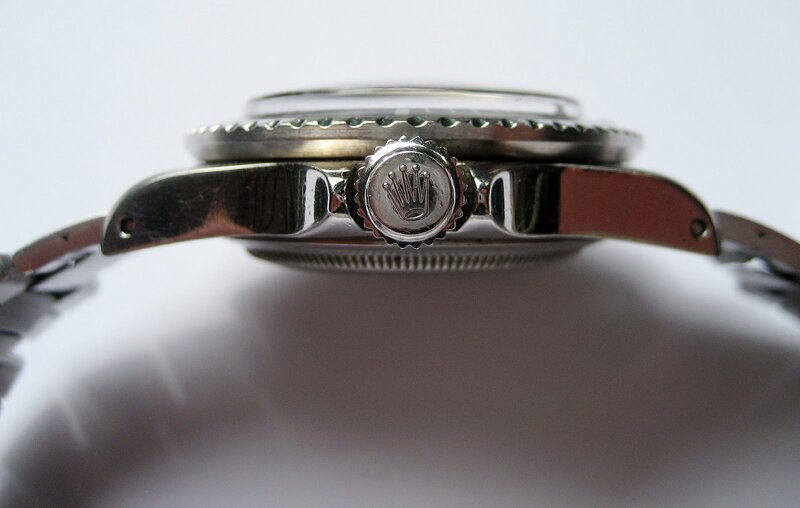 I first learned of Arthur Ashe wearing a Rolex President (Day-Date) from T. Walker Lloyd who told me a great story about how Arthur said that he only wore Rolex. 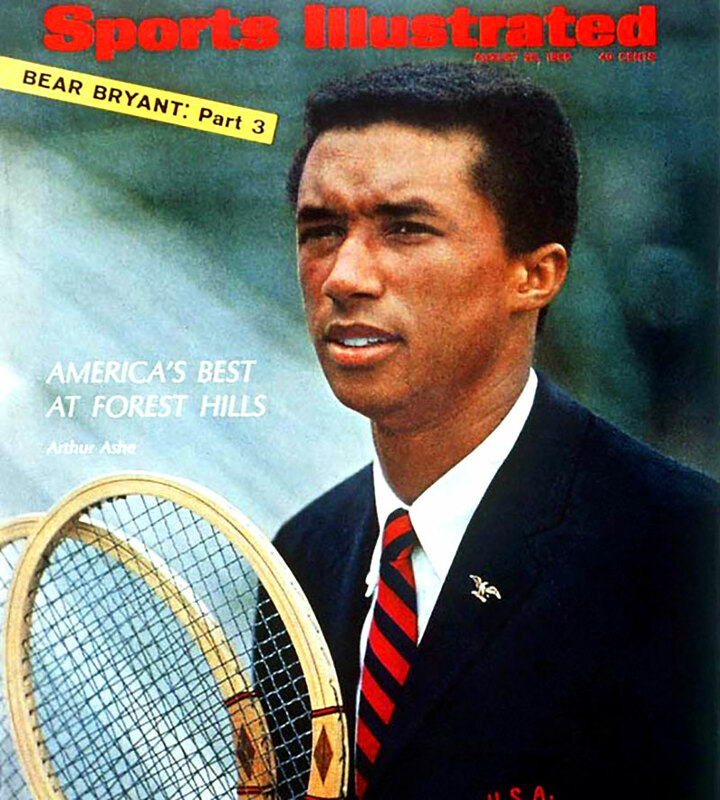 In the photo below we see Arthur Ashe pictured on the cover of a 1966 issue of Sports Illustrated. 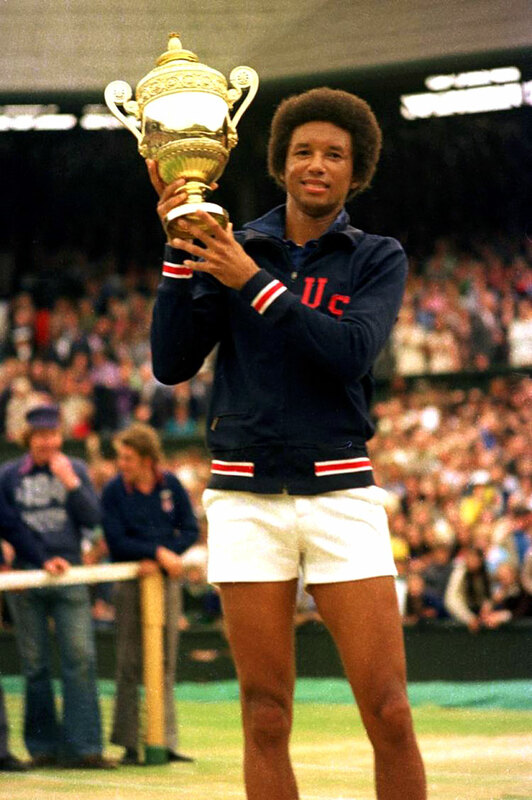 Arthur Ashe is pictured below in 1968 holding up his U.S. Open trophy he received after winning the U.S. Open. Arthur Ashe is pictured below holding up the Wimbledon Trophy for having won the Men's Final Tournament in 1975. Arthur Ashe had previously attempted to win at Wimbledon eight times, before finally winning. 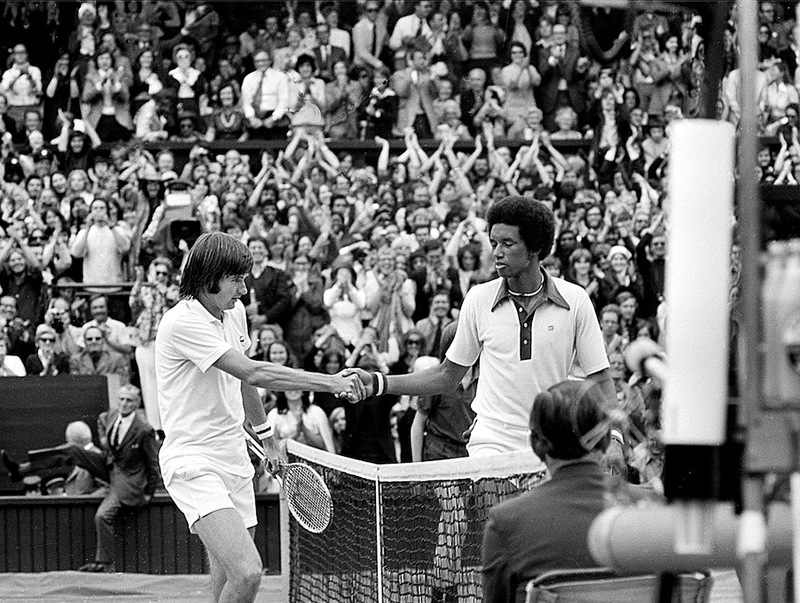 Arthur Ashe is pictured below shaking hands with the reigning Wimbledon Championship, Jimmy Connors in 1975 after Ashe destroyed Connors to win the Wimbledon men's final championship. You can watch the entire 1975 Wimbledon Men's Singles Finals in the video below, which is fascinating. 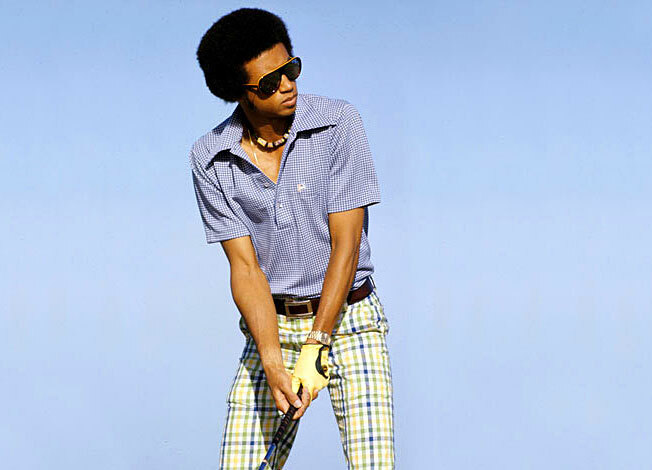 Arthur Ashe is pictured below in 1974 playing golf on a TV show where well-known sportsman competed against each other in a variety of events, and notice he is wearing his Rolex Day-Date while he is playing golf!!! This is something only a REAL Rolex Fanatic would do—play golf while wearing a Rolex President!!! 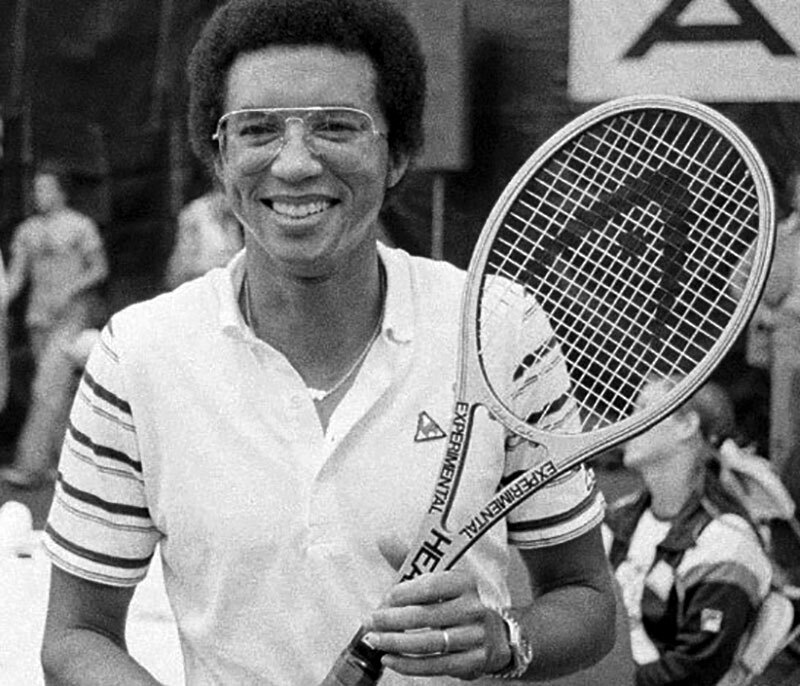 The video below features Arthur Ashe showcasing his Ashe Comp 2 tennis graphite tennis racket he used when he won Wimbledon in 1975. 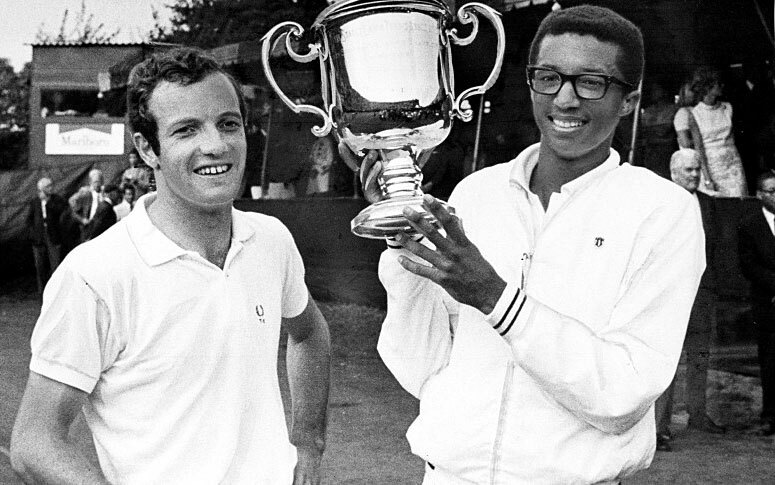 Arthur Ashe was not only an amazing tennis player, but an equally successful entrepreneur. 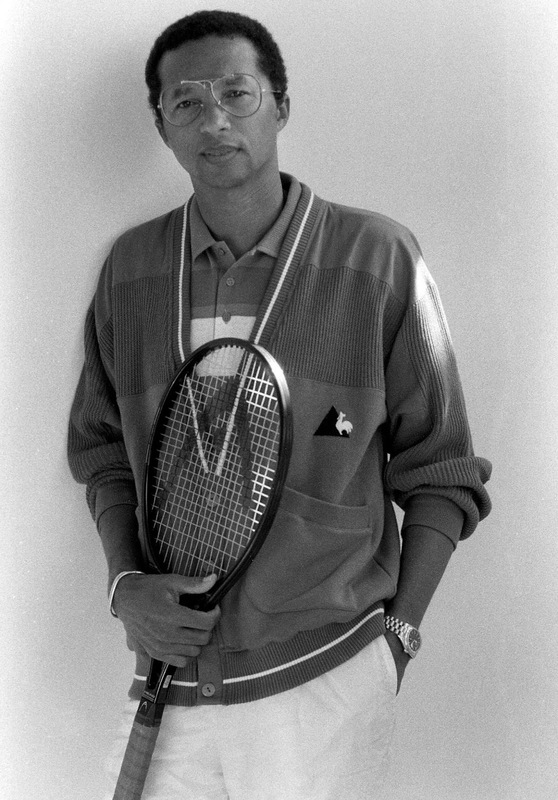 Arthur Ashe is pictured below in 1979, while promoting a prototype of his famous Arthur Ashe tennis racquet, which was made by Head. I used to have one of these Head tennis racquets which at the time was, considered the most state of the art racquet you could buy. 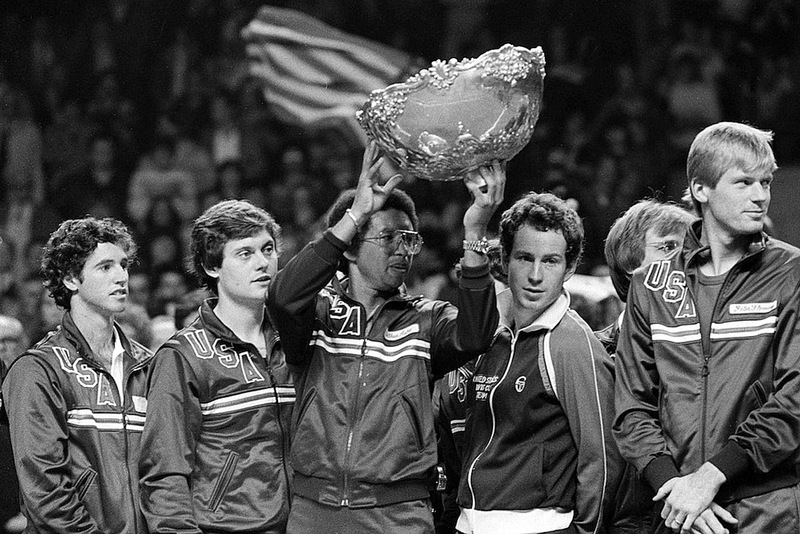 Arthur Ashe is pictured below with the 1982 Davis Cup team which he was the caption of. John McEnroe is pictured next to Ashe. 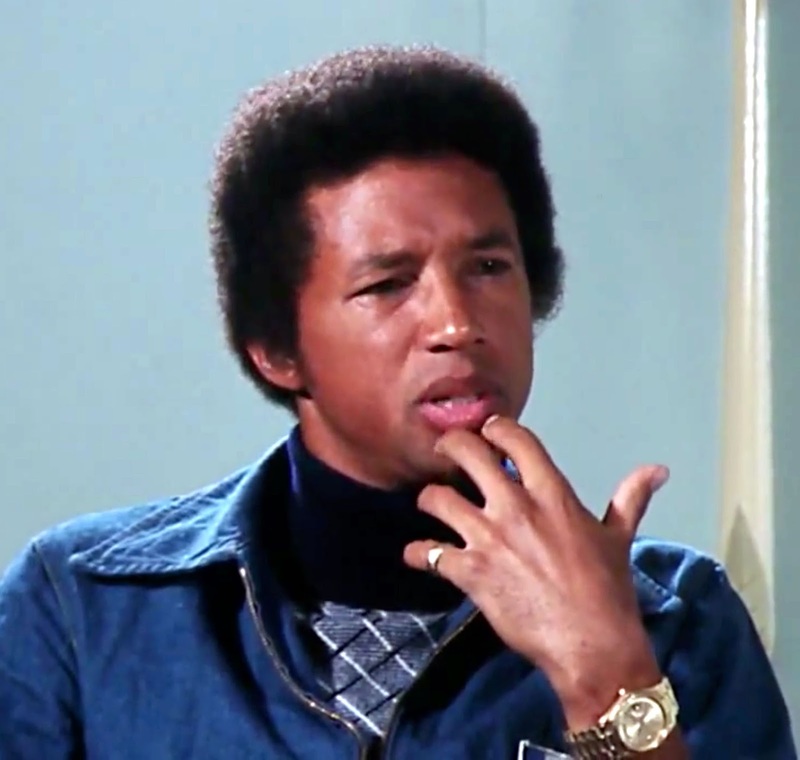 It is amazing that Arthur Ashe wore a yellow gold Rolex President his entire life. 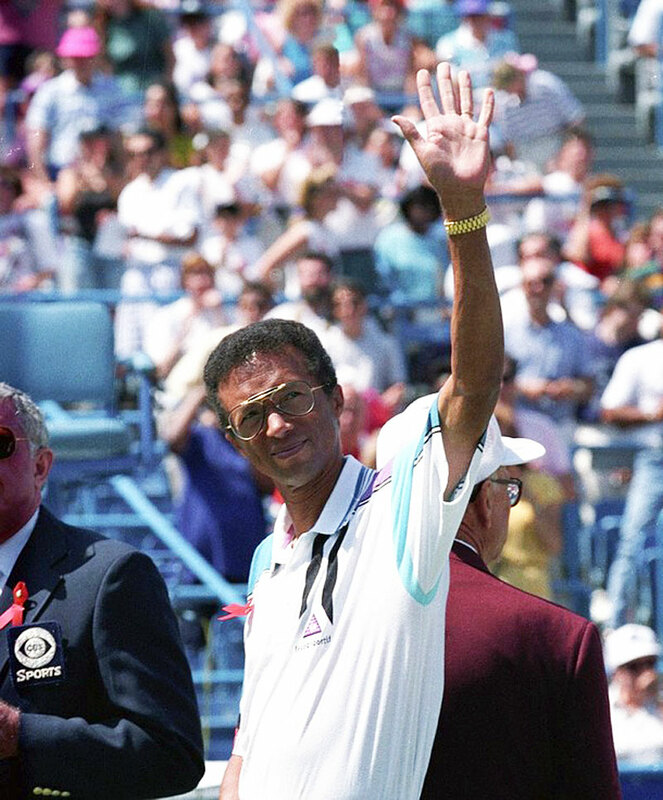 Arthur Ashe died way too young, but he inspired the tennis world like very few ever have or ever will. Arthur Ashe was a man of great achievement and he made it every step of the way with his trademark Rolex Day-Date on his wrist which kept the time of his life!!! 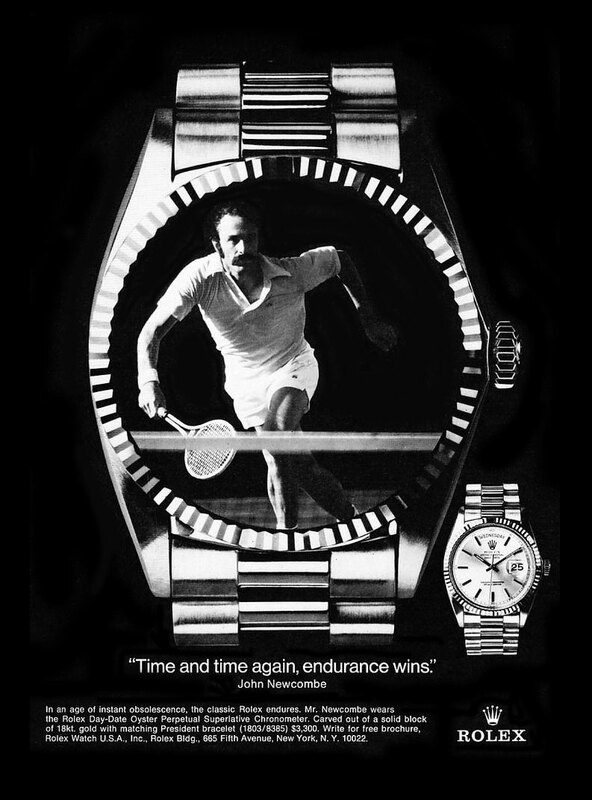 Arthur Asher is pictured below in 1992 in a famous shot of him hugging his Tennis Racquet while wearing his trademark Rolex Day-Date, which was taken three decades after the first image of him at the beginning of this story. 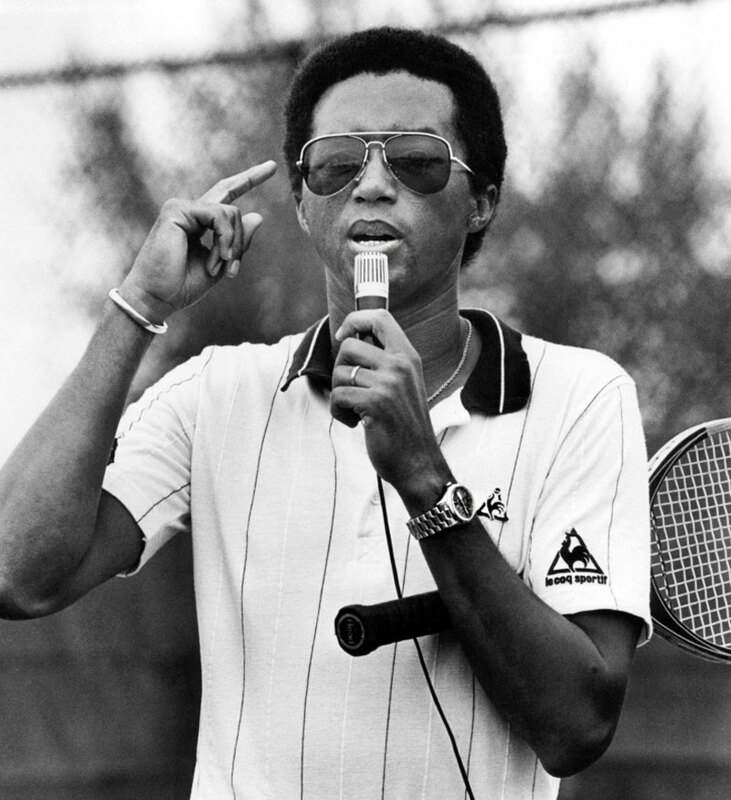 It is fascinating to note Arthur Ashe proudly wore a Rolex Day-Date his entire adult life. A year after the picture below was taken, Arthur Ashe died from AIDS, which he contracted from a blood transfusion that contained the HIV virus in the early 1980s. Arthur Ashe is featured below in a video he made just before he passed away. 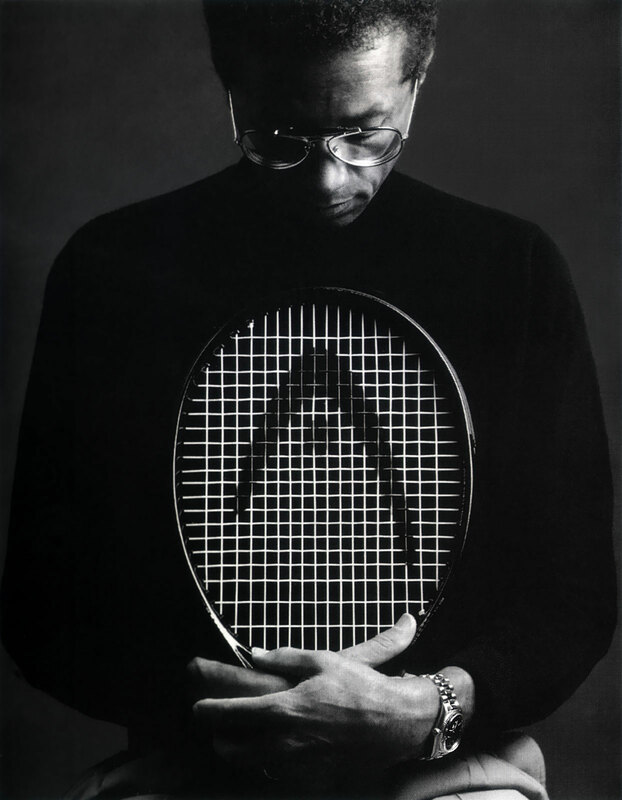 Arthur Ashe passed away on February 6, 1993. The documentary below on Arthur Ashe is AMAZING!!!! I highly recommend watching it! "Right now I have very few possessions. Not because I don't want them, or wouldn't want to use them, but because there is no real need for them logically. I don't have a car because I am never in one place long enough." So what makes Arthur Ashe's answer so ironic? The fact he has so few material possessions, but he is wearing his yellow gold Rolex Day-Date. Also, notice this Rolex Day-Date has a matching Champagne dial, where in the later photos of Arthur Ashe, his Day-Date has a dark dial. 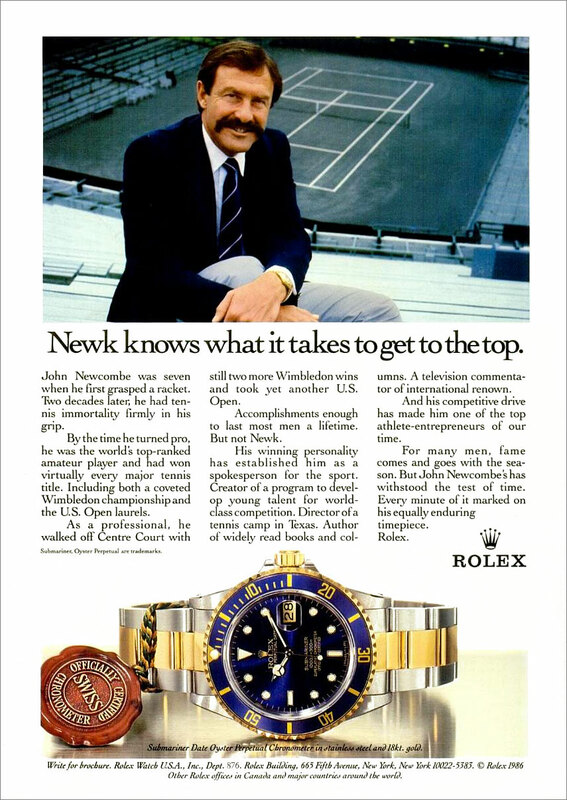 Another key takeaway point is that to the best of my recollection, Arthur Ashe is the first tennis player who won Wimbledon who wore a Rolex, and not just any Rolex, but he flagship 'Rolex Presidential' model. Roger Federer is not only considered to be the greatest tennis player that ever lived, but he is also an official Rolex Ambassador. 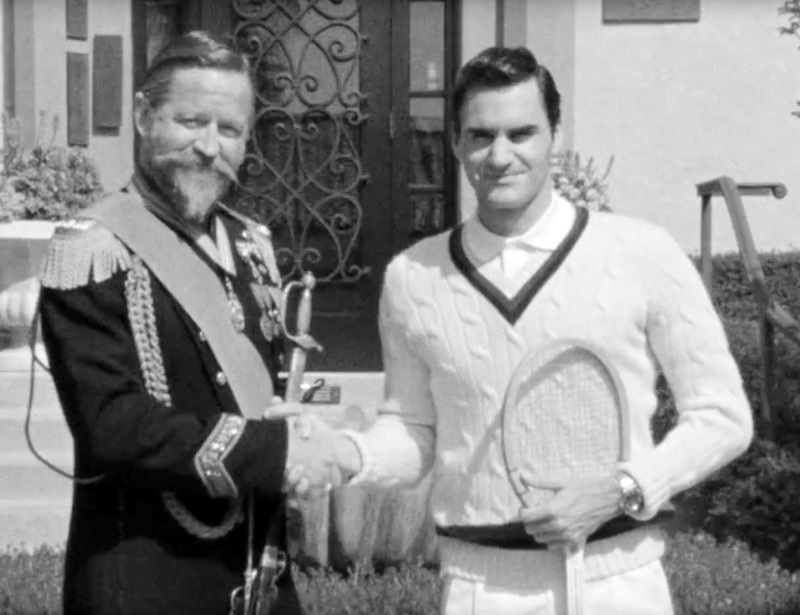 Mercedes just came out with this really funny ad that features Roger, and of course, you see him wearing different Rolex watch models. 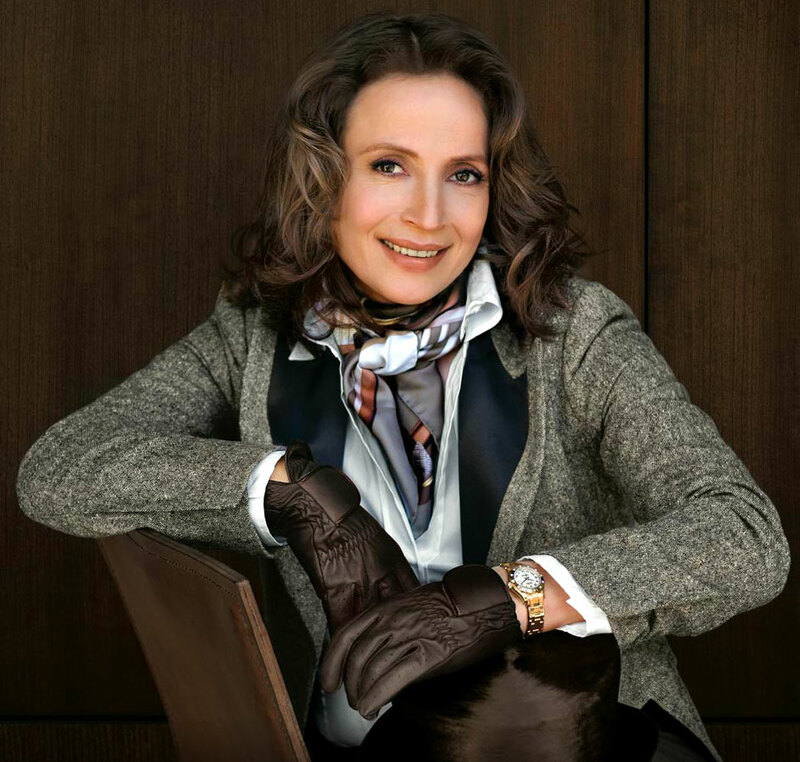 Isabell Werth is one of the top equestrian horseback riders in the world. 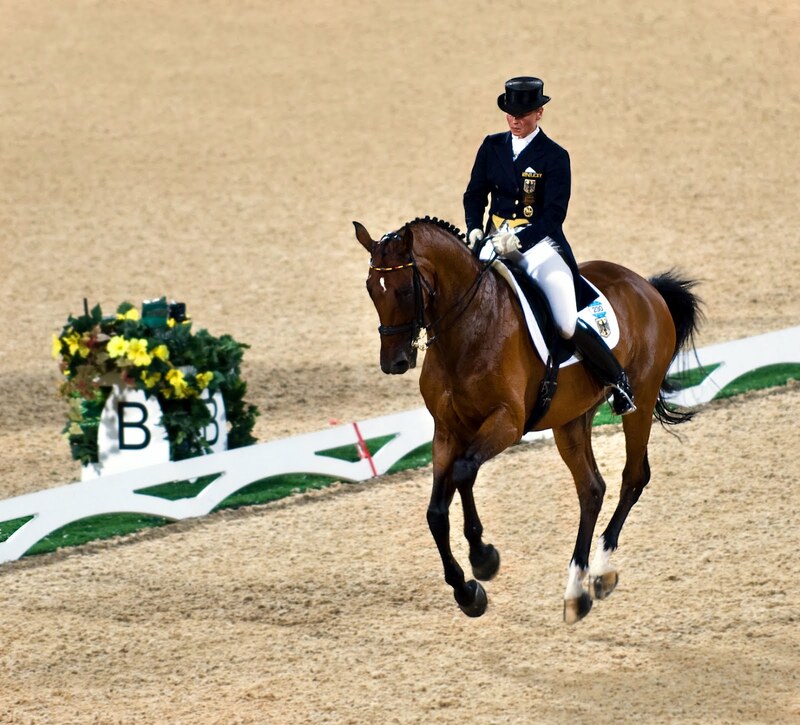 She has won 10 Olympic medals, including 6 gold Olympic medals, as well as 7 Dressage World Championships. Speaking of Olympics, Issabell Werth just won Gold again at the Summer Olympics in Brazil in the Team Dressage event, and she also won Silver a Silver Medal in Individual Dressage. This is a truly remarkable feat, as she has been winning Olympic Gold Medals since her Olympic debut in Barcelona in 1992. She has competed in the 1992, 1996, 2000, 2008 and 2016 Olympics. Equestrian dressage is so amazingly majestic and interesting to watch, as we see in the video below of Isabell Werth's amazing performance! 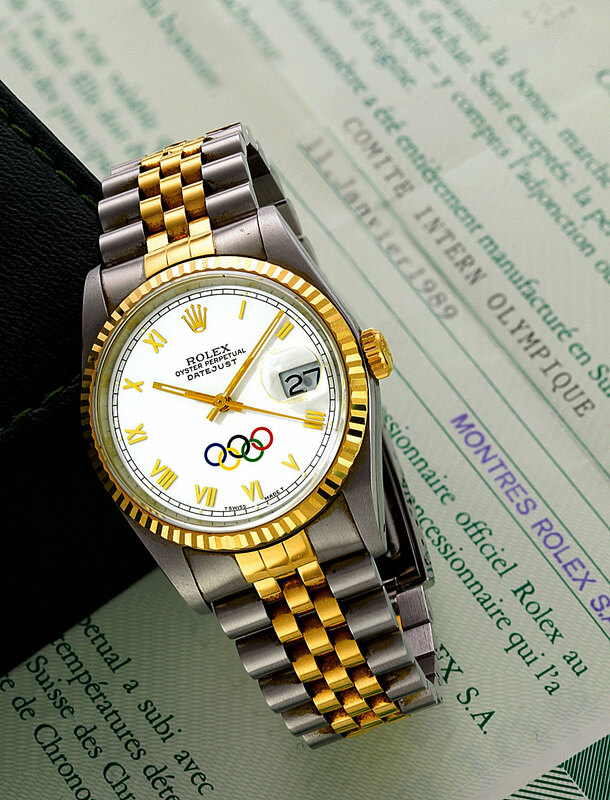 Back in May of 2014, Sotheby's auctioned off a very rare 36MM Rolex Datejust which was made for the International Olympic Committee in 1988. The watch achieved an auction sale price of $24,000. I have seen these models before, and of course it is always interesting to see something so fascinating with two great 20th Century icons together. If I recall correctly, Olympic Skiing legend, Jean-Claude Killy wears this same model. 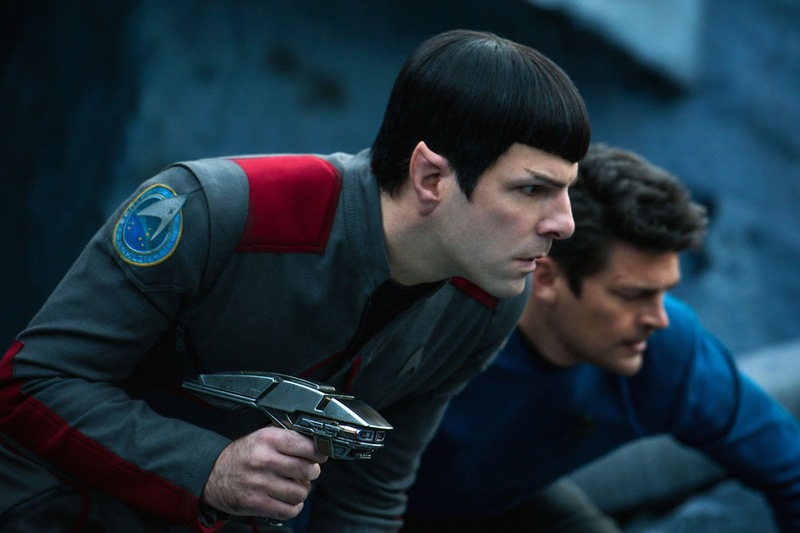 The newest Star Trek Beyond movie is currently in theaters, and some of the key Star Trek actors, and writers wear Rolex watches in real life. 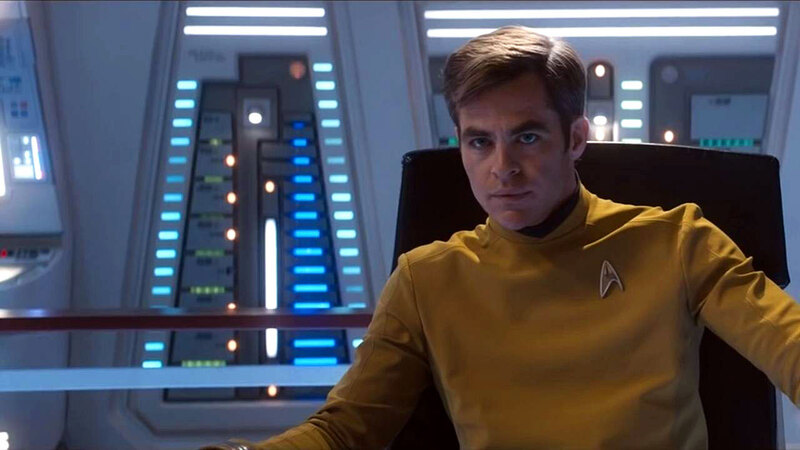 Below we see Chris Pine, who plays Captain Kirk, sporting his vintage stainless steel Rolex Submariner. 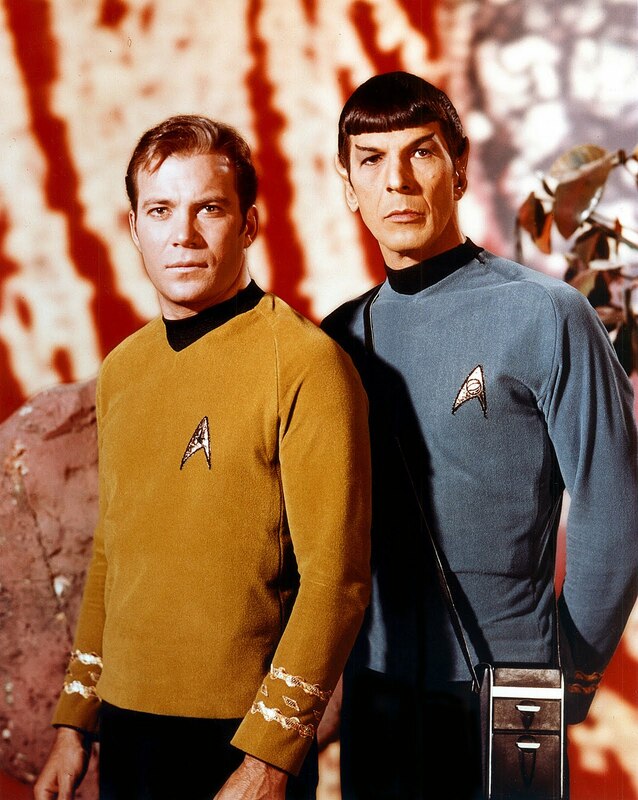 The original Star Trek TV series was just about as iconic as it gets. In the photo below, we see William Shatner as Captain Kirk, along with Leonard Nimoy, who played the fascinating Mr. Spock. 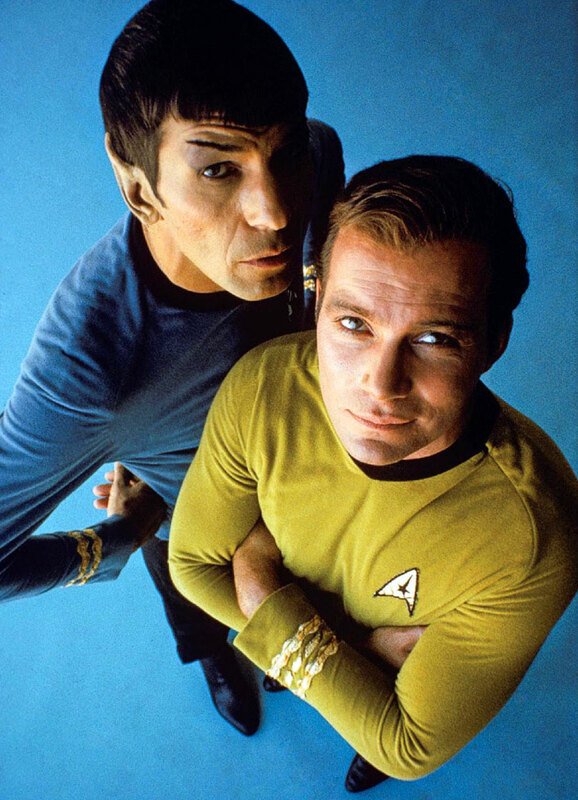 Shatner and Nimoy were so iconic together, they were almost like peanut butter and jelly. Speaking of Captain Kirk wearing a Rolex Submariner, let's not forget that the original Captain Kirk played by William Shatner also wears a stainless steel Rolex Submariner. 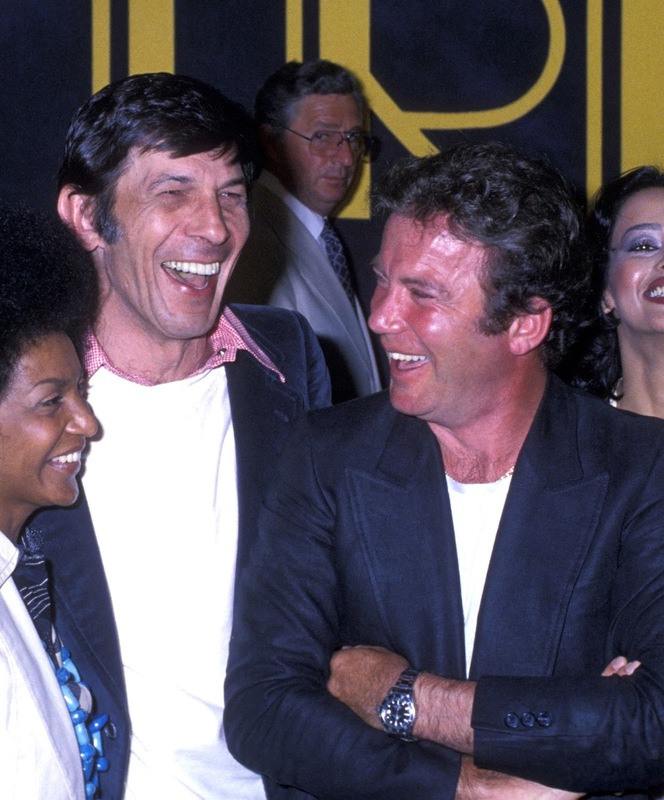 In the photo below we see William Shatner attending a Star Trek movie debut, standing next to Leonard Nimoy, who was the original Spock. 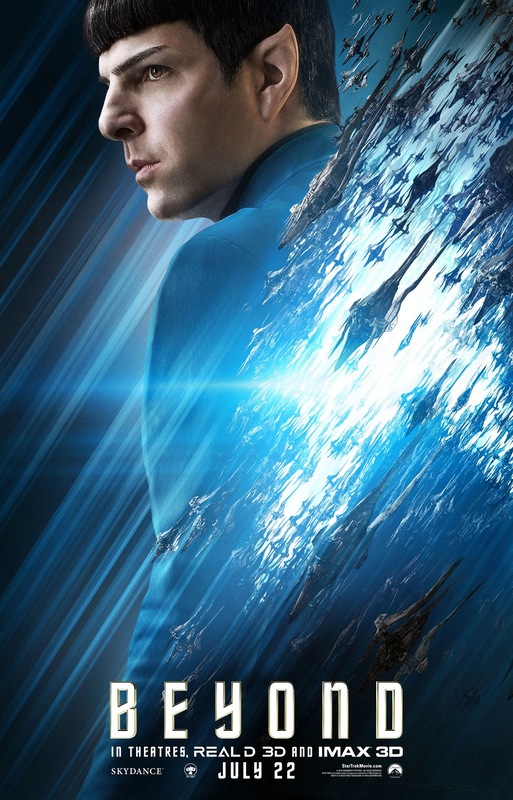 Speaking of Leonard Nimoy who played Mr. Spock, it is hard to imagine anybody could ever do as good a job, but Zachary Quinto who is pictured below does an excellent job. 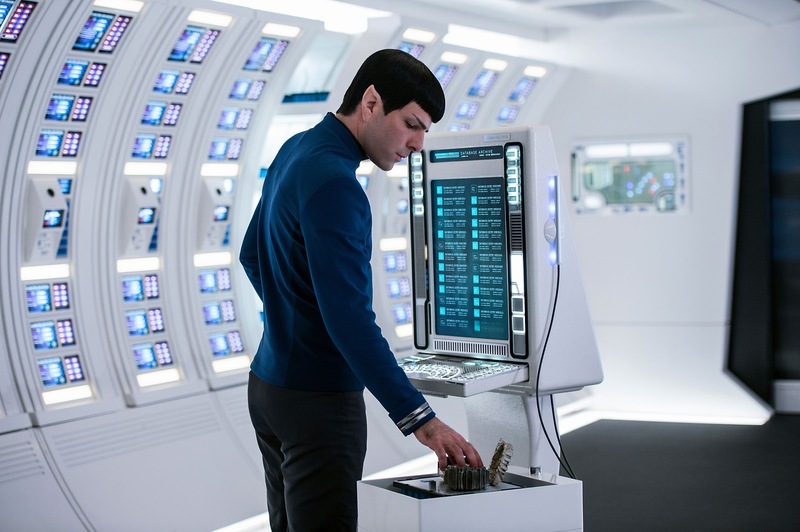 Notice Zachary Quinto is wearing a Rolex Oyster Perpetual in the photo below. 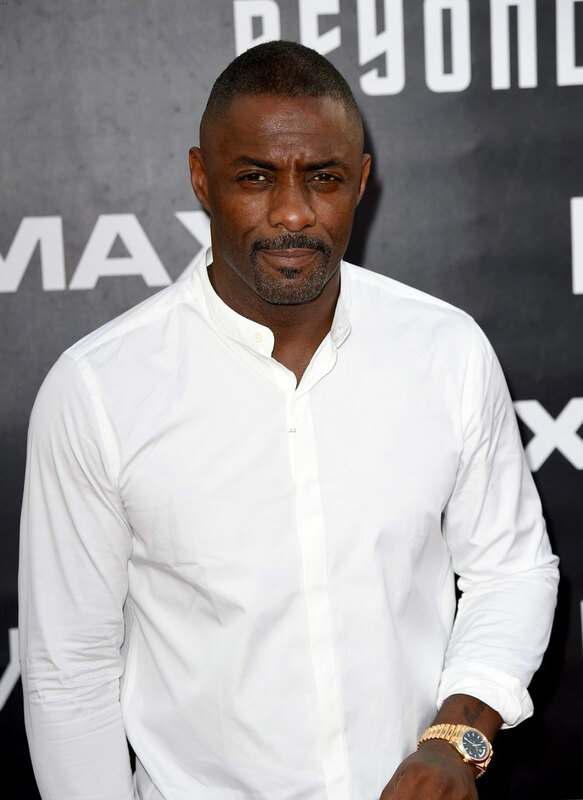 Idris Elba is pictured below and he plays Krall in the new Star Trek Beyond movie. As you can seen in the photo below, he is wearing a yellow gold Rolex Day-Date. 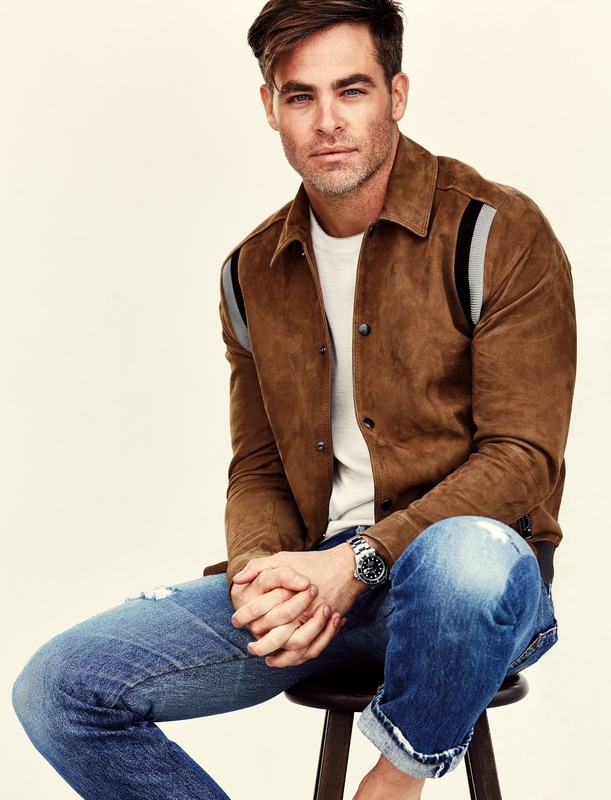 Chris Pine who plays Captain Kirk in the new Star Trek movies can be seen bellow at the Indianapolis 500 wearing his Submariner, along with wearing his Steve McQueen Foldable Persol Sunglasses. I just learned that T. Walker Lloyd recently passed away, so I thought it would be fitting to republish this amazing story of his life achievement, which I originally published eight years ago—back in 2008. In 2008 I spent many hours interviewing T. Walker Lloyd, and we became instant pals. We both shared a profound love for the Rolex brand and Rolex history. To date I have only published approximately 3 hours of the interviews, and perhaps in the future, I will find time to publish more from my interview archive. One of the things that makes the published podcast interview so profound is that Rolex has an unbroken code of silence when it comes to their executives. In other words, no Rolex executive, other than the CEO has ever been interviewed. 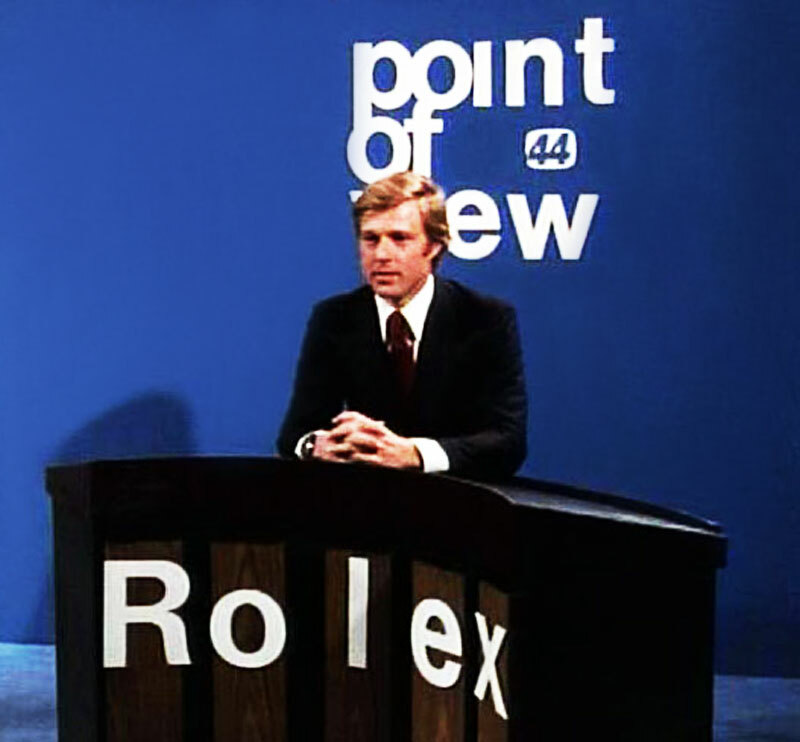 Of course, when I conducted these interviews, T. Walker Lloyd had been retired from Rolex for many years. 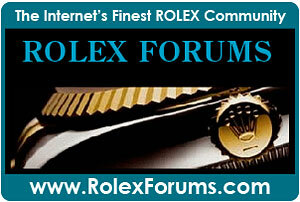 That being said, it is deeply profound just how much I learned about Rolex history from T. Walker Lloyd. I will miss "T", as his friends called him, and wish him Godspeed. 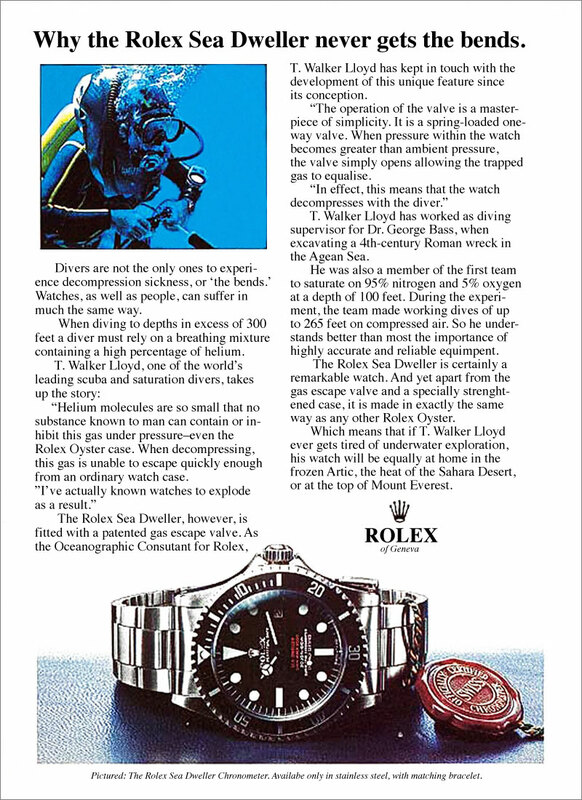 As I reflect back on this story, I realize that T. Walker Lloyd's insight and contribution offered tremendous insight into Rolex's conquest of the DEEP-SEA, and especially his contribution to the development of the Rolex SEA-DWELLER. 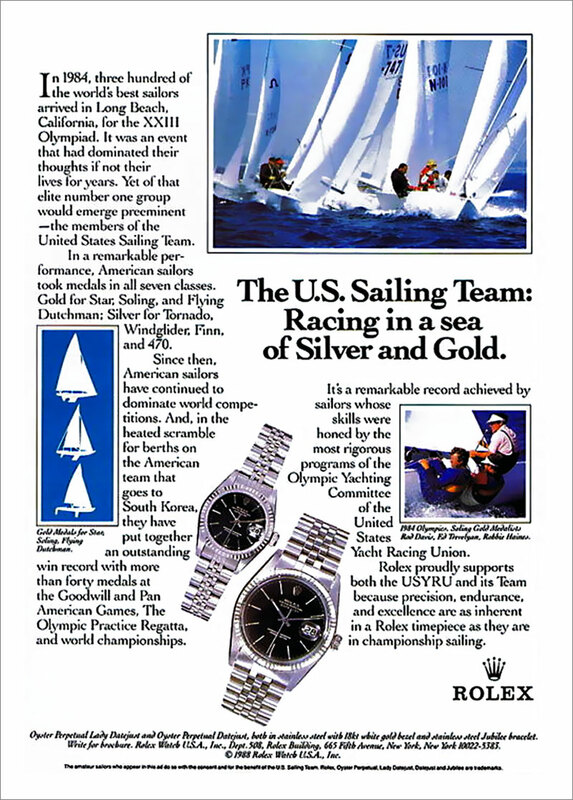 In the future I plan to add this story as a chapter to my 18 part series titled "The Complete History Of The Rolex Submariner & SEA-DWELLER: Rolex's Conquest Of The Ocean." T. Walker Lloyd was a dynamic Rolex executive for close to a quarter century. I recently completed a 3-part podcast interview series with T. Walker Lloyd that is amazing!!! 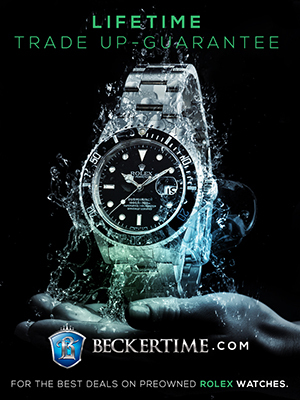 T. Walker started his quarter-century career with Rolex as an oceanographic consultant and three years later became a full-time Rolex executive in New York with Rolex U.S.A.
T. Walker Lloyd was originally hired by Rene-Paul Jeanneret in Geneva and began working with Rolex in 1965 and retired from Rolex in 1990. During T. Walker Lloyd's executive career he saw Rolex, under the dynamic leadership of André Heiniger, grow from a successful Swiss company to the ultra-successful behemoth it is today. Today, I released Podcast interview 3 of 3 with T. Walker Lloyd. 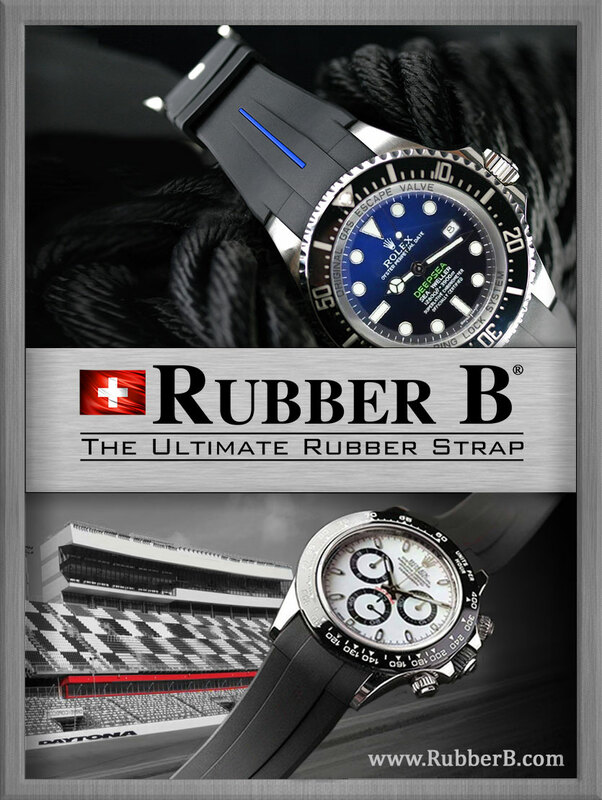 In Part 1 you get an overview of the early years of his career where he worked with the U.S. Navy SEALAB program on the development of the Rolex SEA-DWELLER. You will also learn about how he went on to become a Rolex executive and the goto guy for working with celebrities, actors, athletes and astronauts. 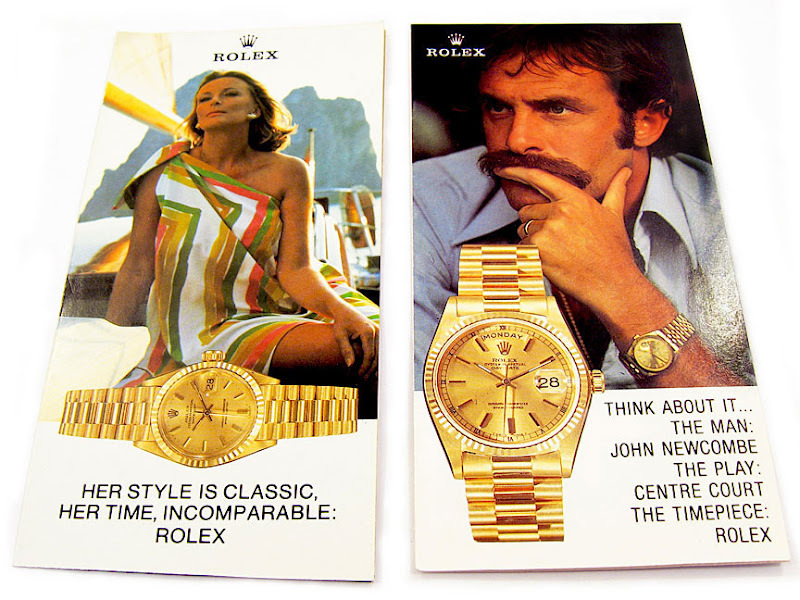 In Part 2 you learn about how the Rolex Day-Date got its name of "The Rolex President" and you also learn about the back story of the NASA Rolex Moon Watches as well as how T. Walker Lloyd provided watches to man movie and TV stars including Tom Selleck for Magnum P.I. 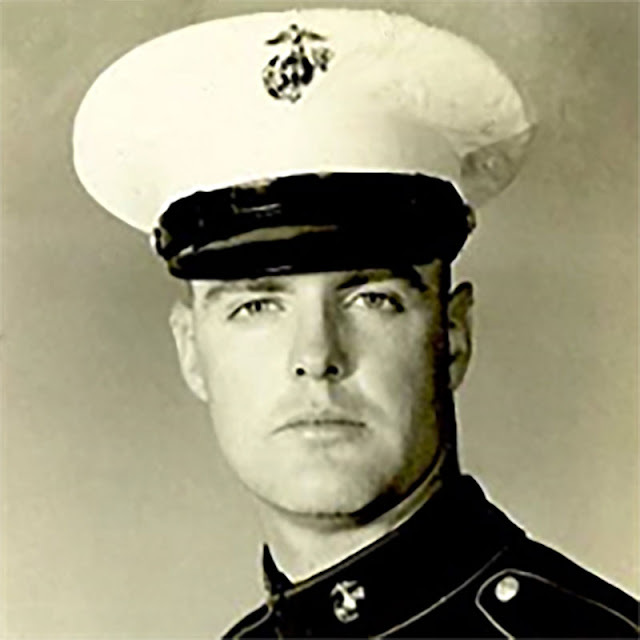 In Part 3, T. Walker shares more fascinating stories about sports figures, supermodels, celebrities, and President Lyndon Johnson. I believe this is the first time in history anyone has completed a recorded interview with a Rolex executive and this is very exciting. 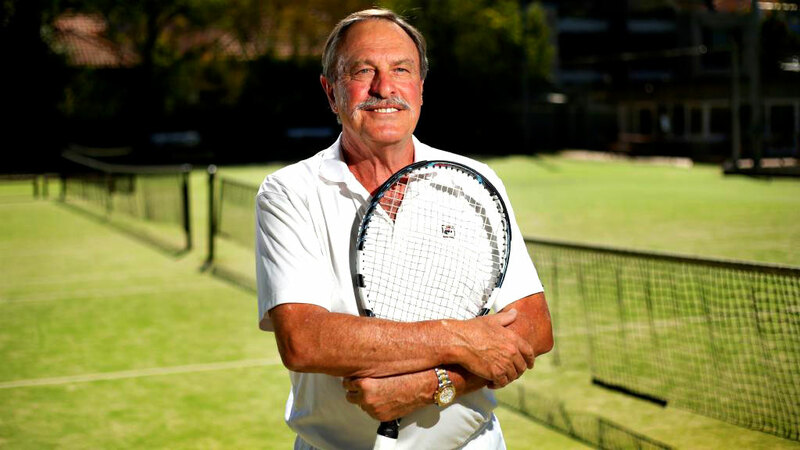 T. Walker is a sportsman and gentleman of amazing achievement and has a fascinating and magnetic personality. 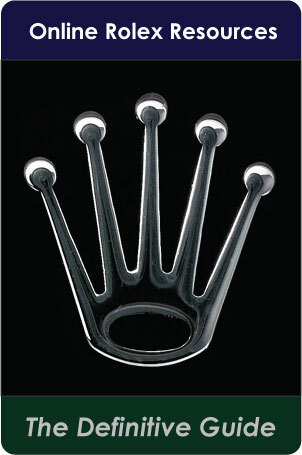 His insight into what makes Rolex tick, literally and figuratively is uncanny. 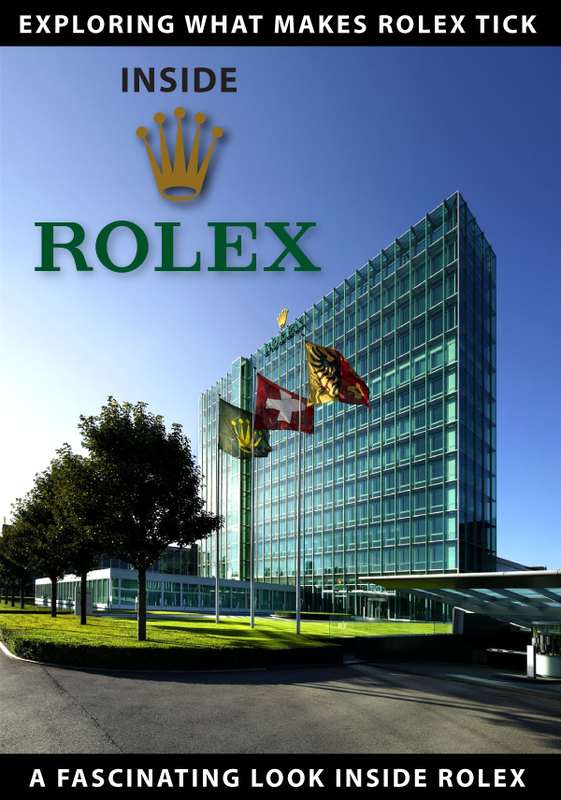 I learned so much about Rolex' amazing history from T. Walker, that my head is still spinning!!! 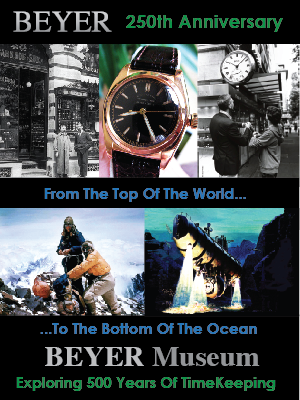 T. Walker was not only a Rolex executive, but a highly accomplished Deep-Sea-Diver and oceanographic expert. 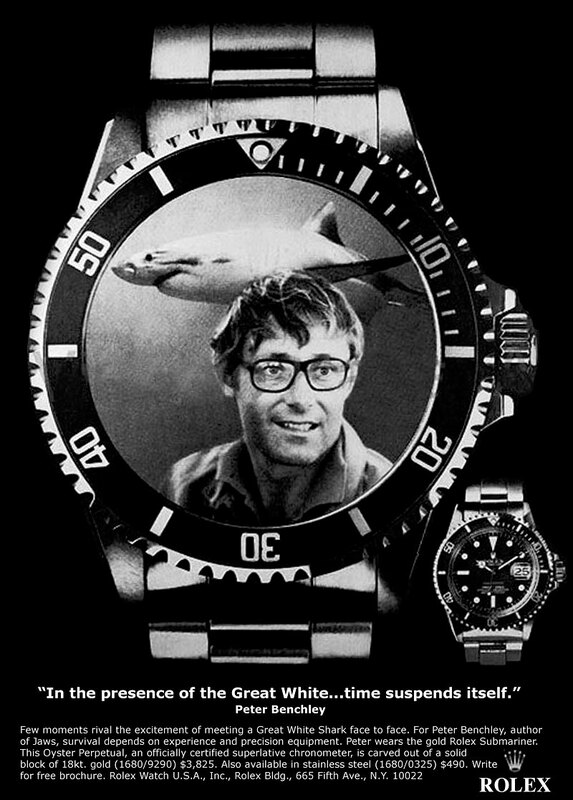 T. Walker Lloyd appeared in the following Rolex advertisement below and also worked with Peter Benchley on the major motion picture, Jaws. The following images and show notes go with Part 1, and Part 2 show notes and images are directly under Part 1. 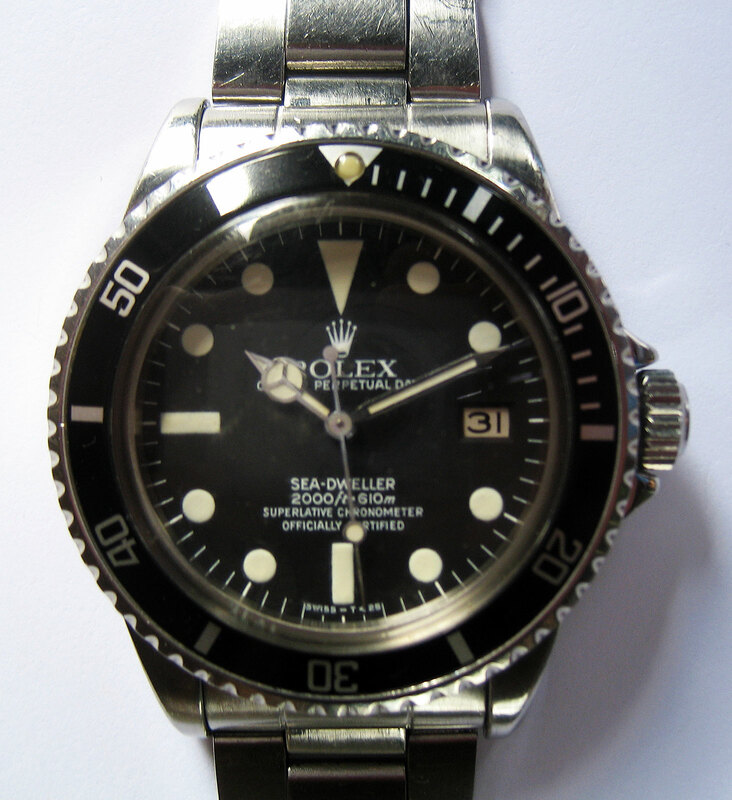 Until I published the story of Scott Carpenter and SEALAB, it was commonly believed that Rolex developed the SEA-DWELLER for the French diving company, Comex. 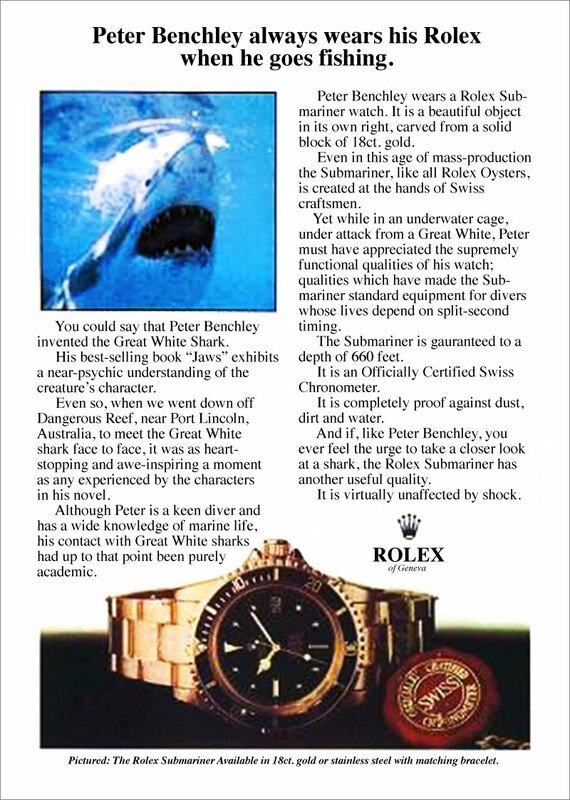 This is partially true, but Rolex being represented by T. Walker Lloyd, worked with SEALAB's Bob Barth & Scott Carpenter on the development of the Gas or Helium Release Valve that was added to the Rolex SEA-DWELLER, thus, as leading Rolex history expert, James Dowling recently pointed out, "The SEA-DWELLER owes more of its genesis to SEALAB than COMEX." In Part 1 of the podcast series I speak with T. Walker Lloyd about the development of the Rolex SEA-DWELLER and we discuss COMEX's role. Here is a Comex ad from that timeframe. Months ago I did an extremely detailed article about Astronaut & Aquanaut Scott Carpenter that included a podcast interview. 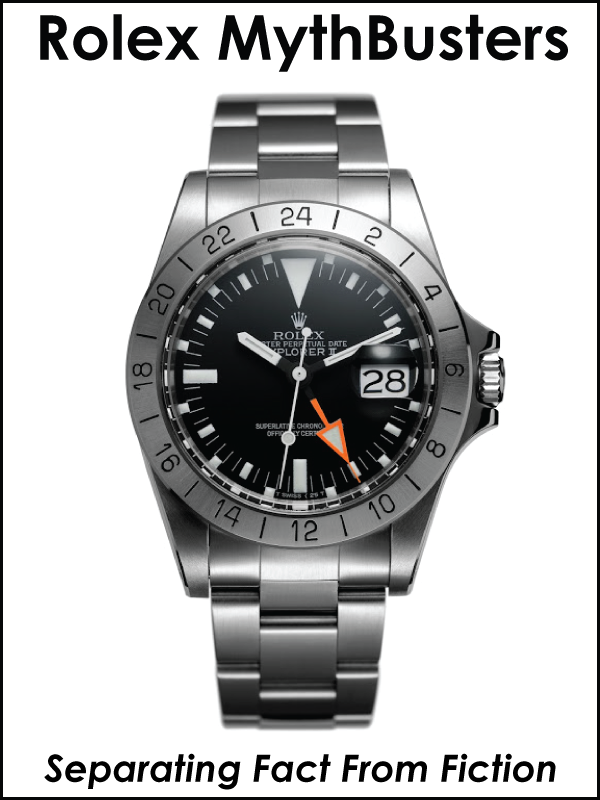 In that interview I learned about Scott Carpenter's involvement with SEALAB on the development of the Rolex SEA-DWELLER. This is what led me to the director of SEALAB, Bob Barth, who led me to T. Walker Lloyd. 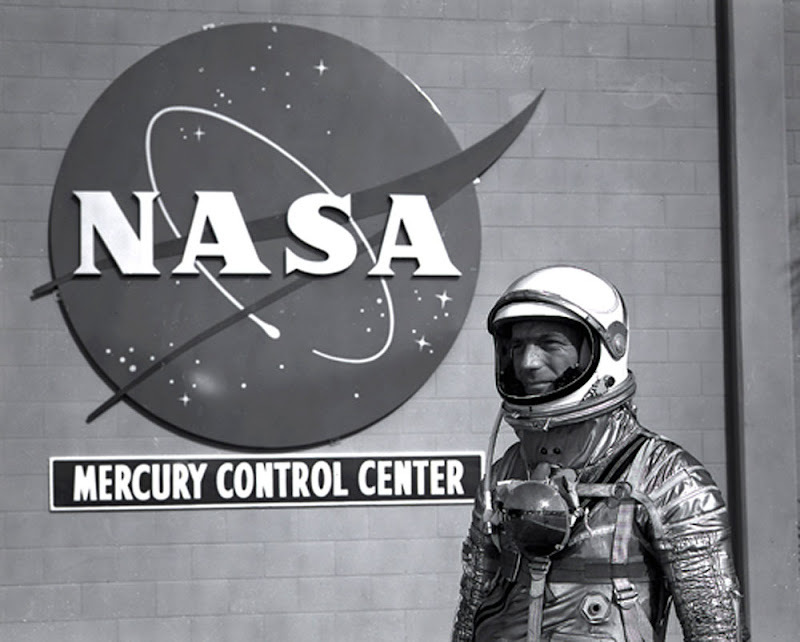 To best understand Scott Carpenter's involvement in the development of the Rolex SEA-DWELLER we have to go back to the NASA Mercury program. 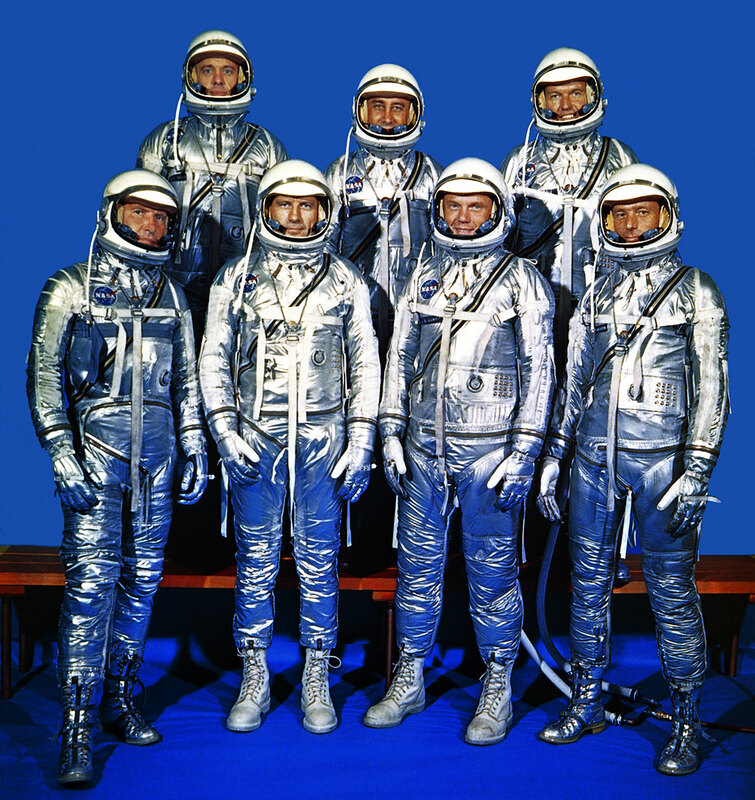 The photo below is of The Original 7 Mercury astronauts. 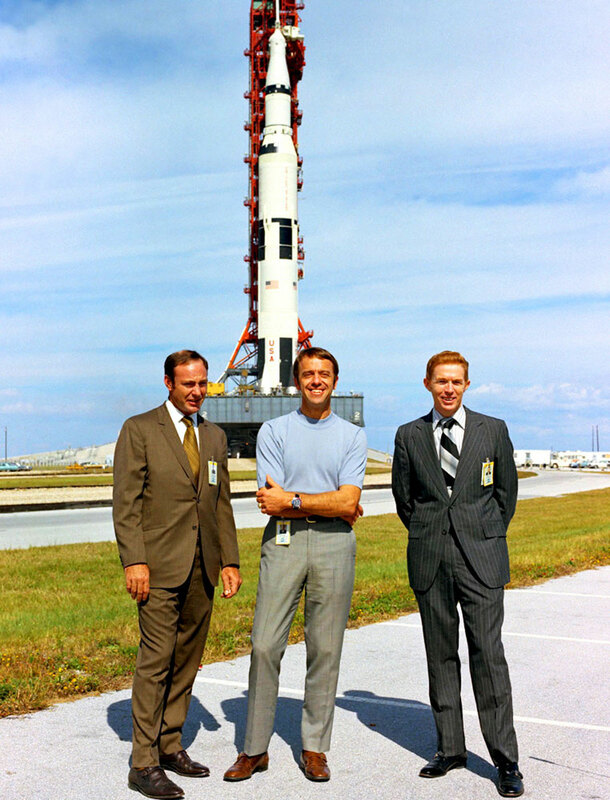 Scott Carpenter is pictured in the bottom right hand corner of the photo. 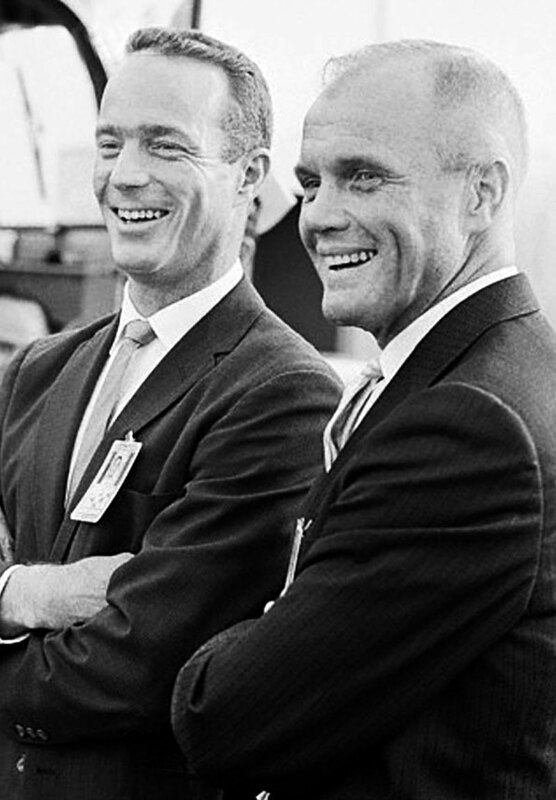 Scott Carpenter is pictured below with his fellow Mercury astronaut John Glenn. John Glenn was the first American astronaut to leave Earth's atmosphere and he orbited around the earth three times before he landed. 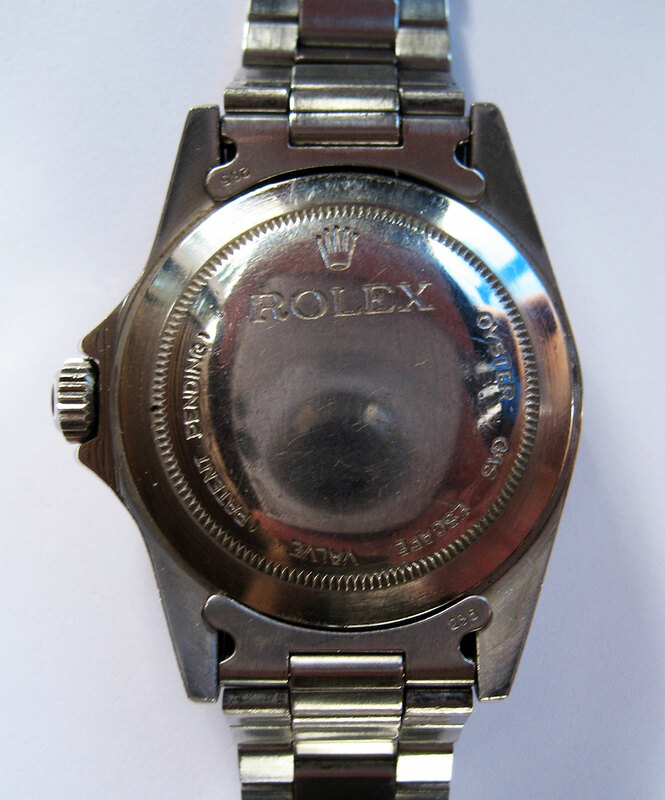 In later episodes of the T. Walker podcast interview we will learn about how John Glenn not only wore a Rolex but also about his involvement as a conduit between NASA and Rolex. Scott Carpenter was the second American to leave Earth's orbit and he also orbited around the globe three times. Scott began his career as a U.S. Navy test pilot and was featured in Tome Wolfe's book, The Right Stuff. Carpenter then he went on to become a part of the U.S. Navy's SEALAB program. 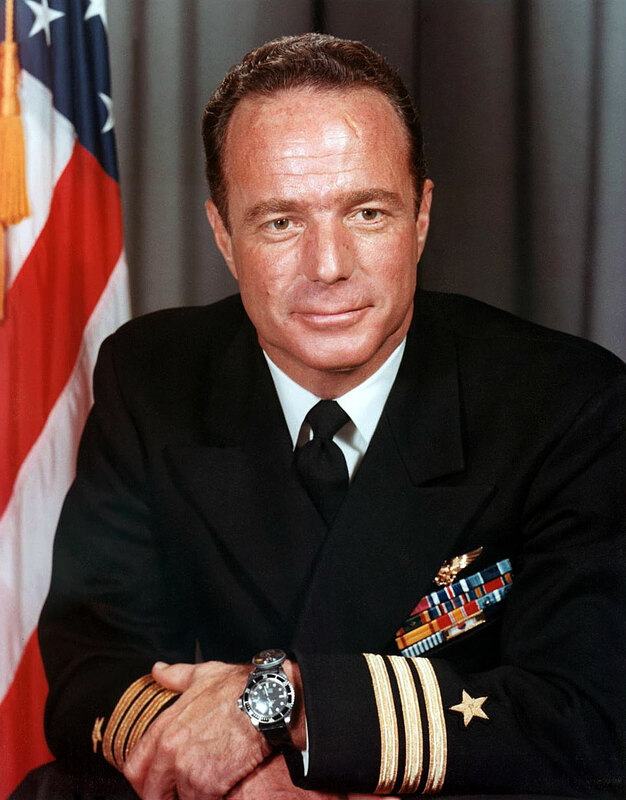 In the photo below you can see Scott Carpenter wearing his Rolex Submariner on a leather strap. 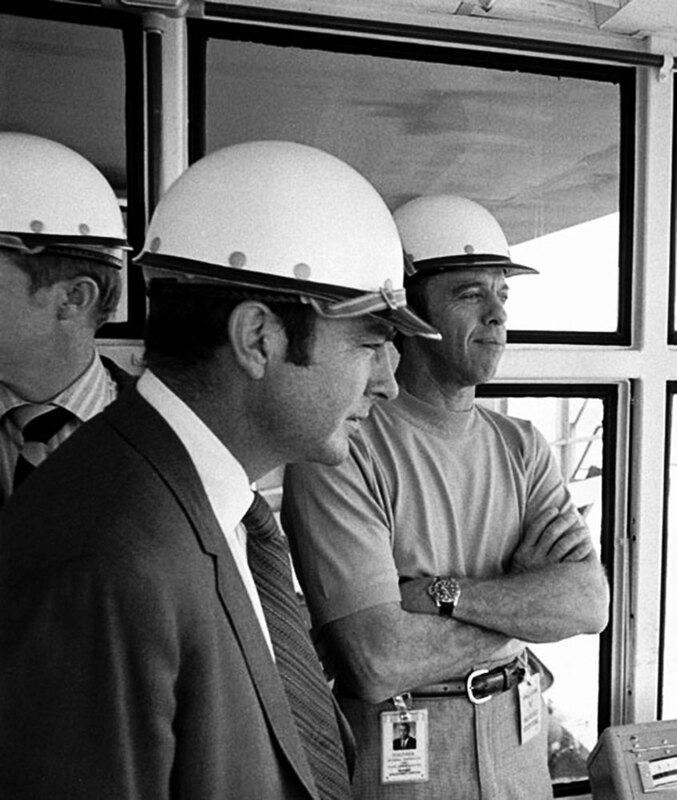 Scott Carpenter learned about the NAVY SEALAB program from his pal, Jacques Cousteau. 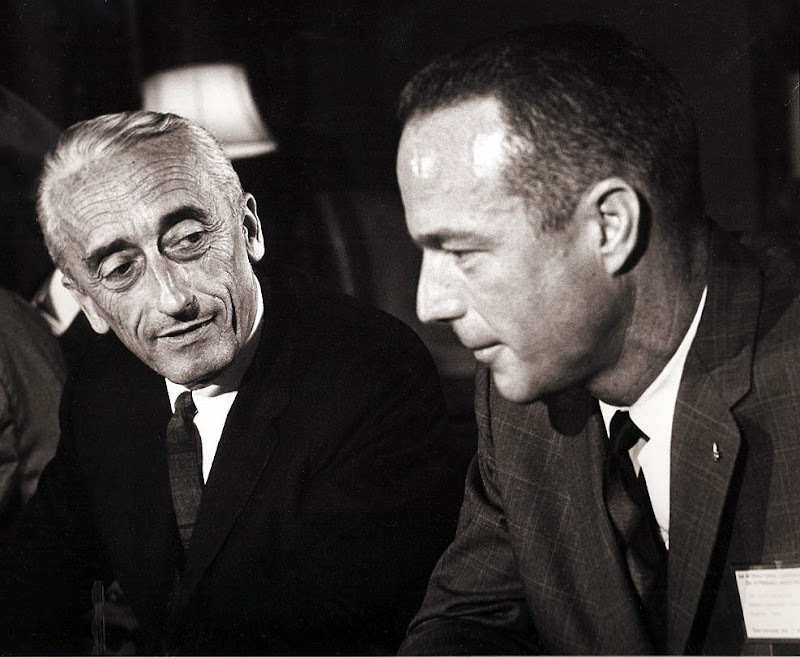 Scott Carpenter was so inspired by what Jacques Cousteau was doing that he asked the U.S. Navy if he could work with Jacques Coustea. 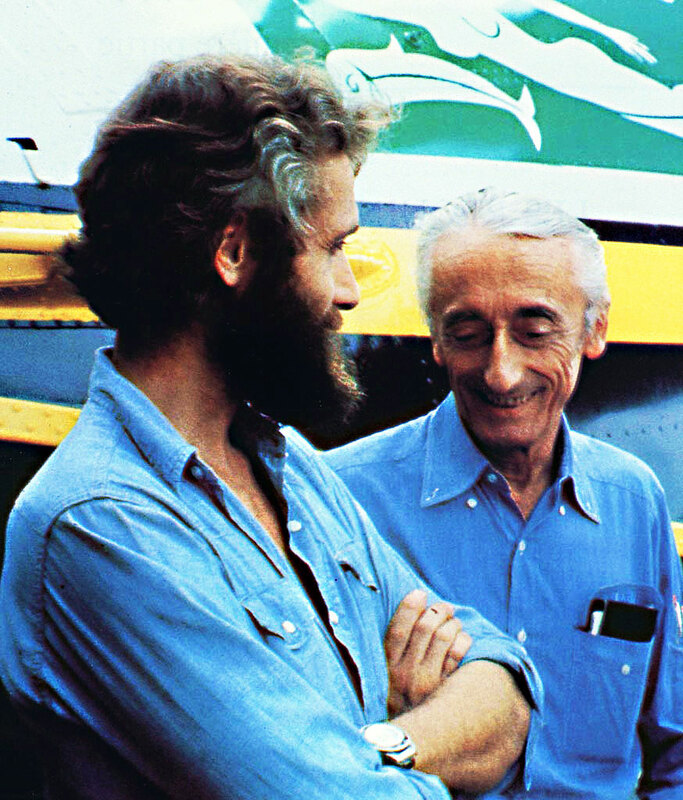 Jacques Cousteau was really the first SEA-DWELLER with his Conshelf program that he developed with the French Navy in the early 1960s. SEALAB was really the U.S. Navy's version of the French Conshelf. 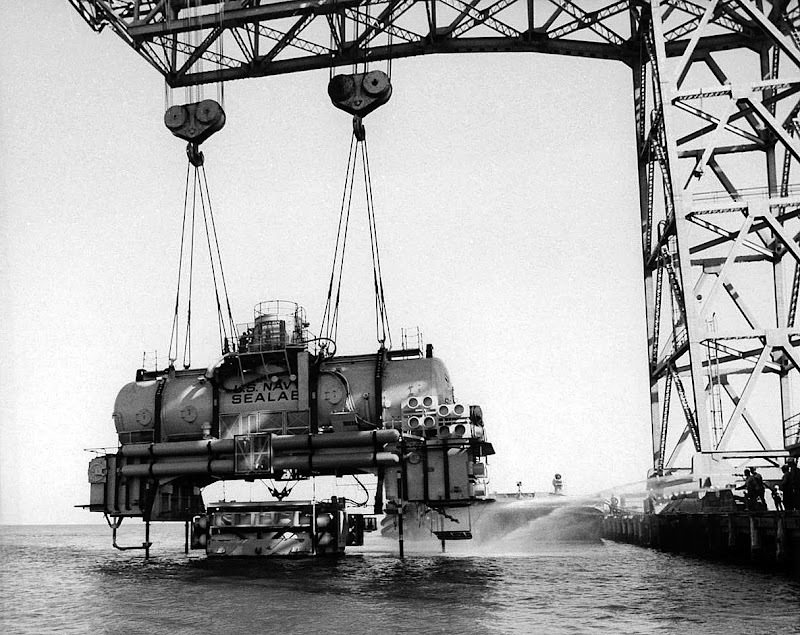 The SEALAB habitat is pictured below hovering in dry-dock. 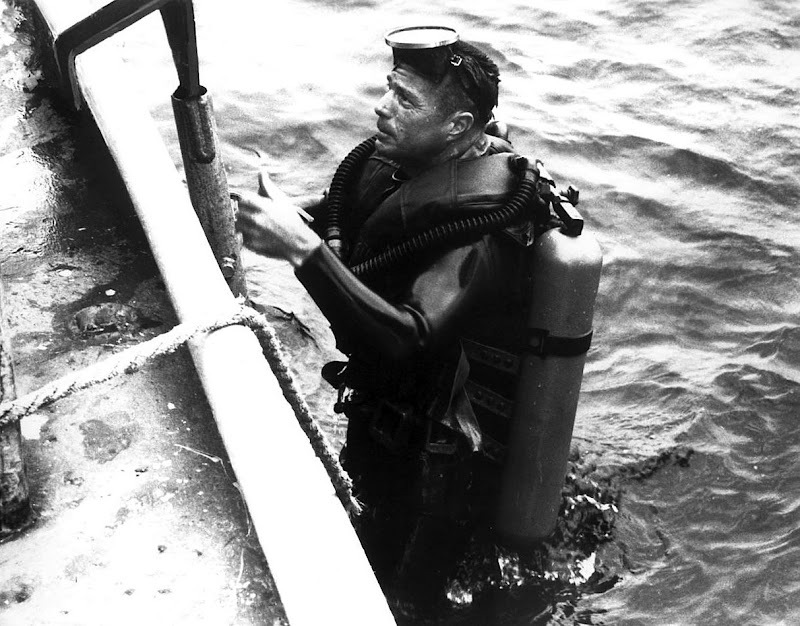 Scott Carpenter was the head of the dive team for SEALAB and is pictured below. 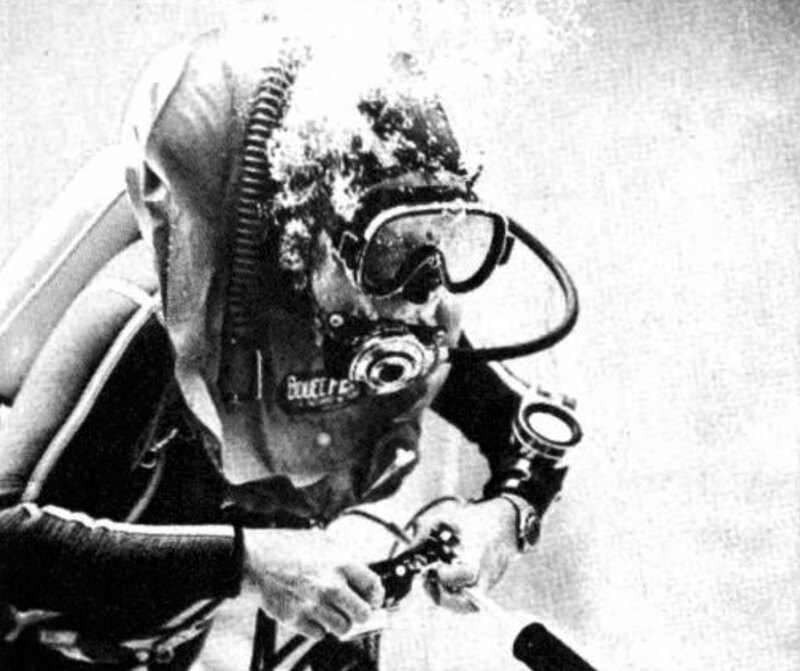 As T. Walker Lloyd mentioned in his podcast interview, the SEALAB saturation divers were experiencing a challenge with their crystals exploding off their Rolex Submariner watches when they would come-up during decompression. So Bob Barth, the director of SEALAB worked with Rolex on the development of the helium gas escape valve with T. Walker Lloyd. 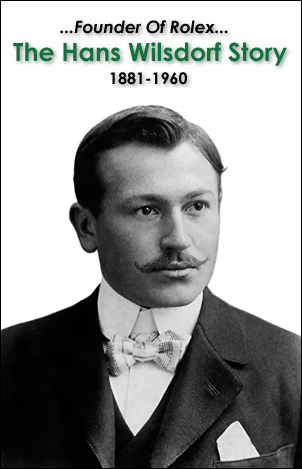 T. Walker Lloyd came up with the idea that even though the gas escape valve on the SEA-DWELLER was only for emitting helium that it should not be named "The Helium Escape Valve." He argued it should be named "The Gas Escape Valve" because he said that in the future saturation divers might likely use other gases. 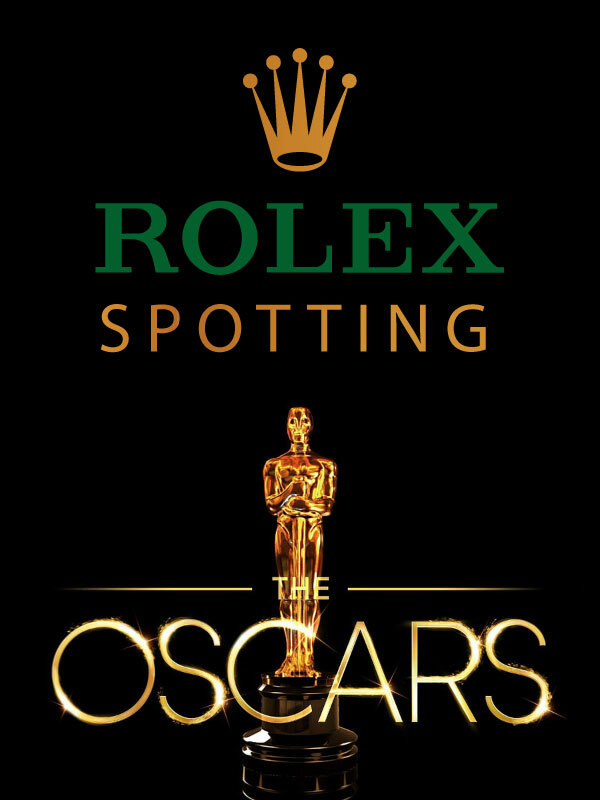 To this day, Rolex calls it the "The Gas Escape Valve," which is displayed prominently on the new DEEP-SEA SEA-DWELLER inner ring. 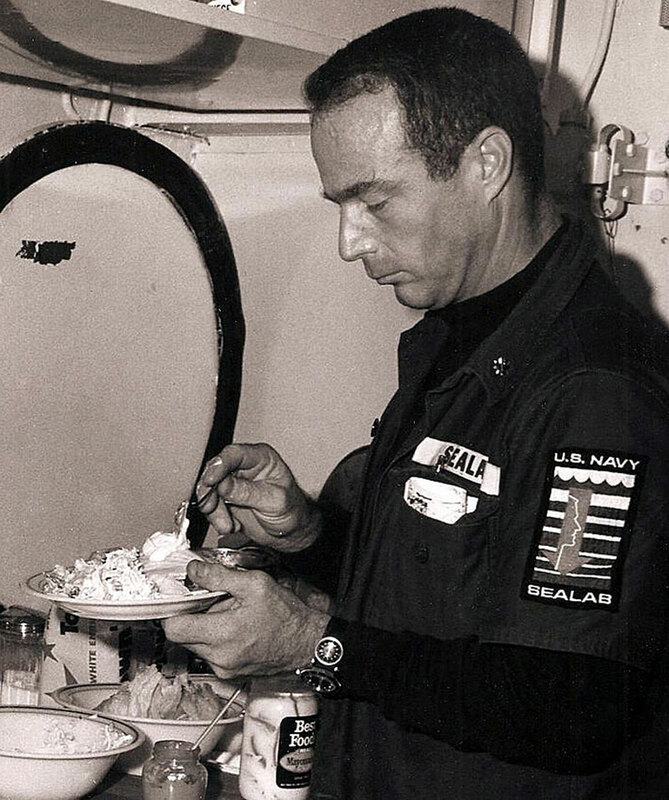 Scott Carpenter is pictured below while living under the ocean on SEALAB 2 for 28 days, which set a record for living in an underwater habitat. Notice the Rolex Submariner on his wrist. The next four recent photos were taken exclusively for Jake's Rolex Watch Blog and feature one of Scott Carpenter's early "Patent Pending" Rolex SEA-DWELLERS which he still owns. 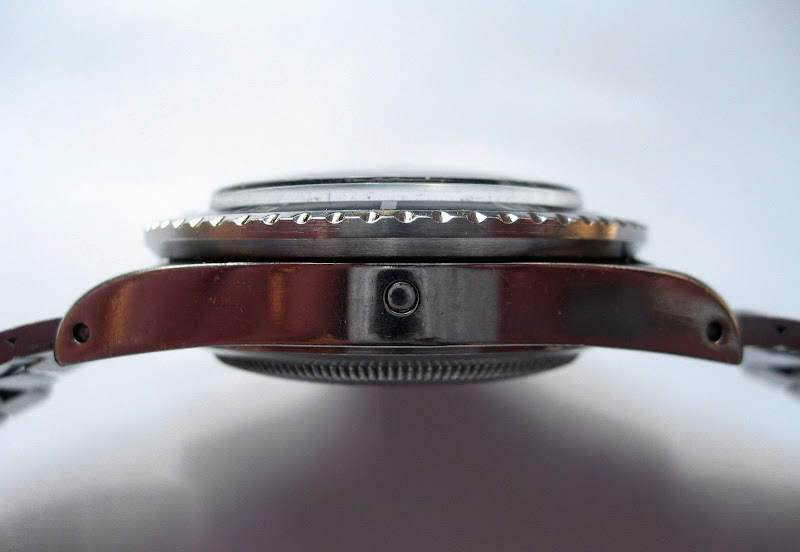 Notice the Patent Pending designation on the caseback. 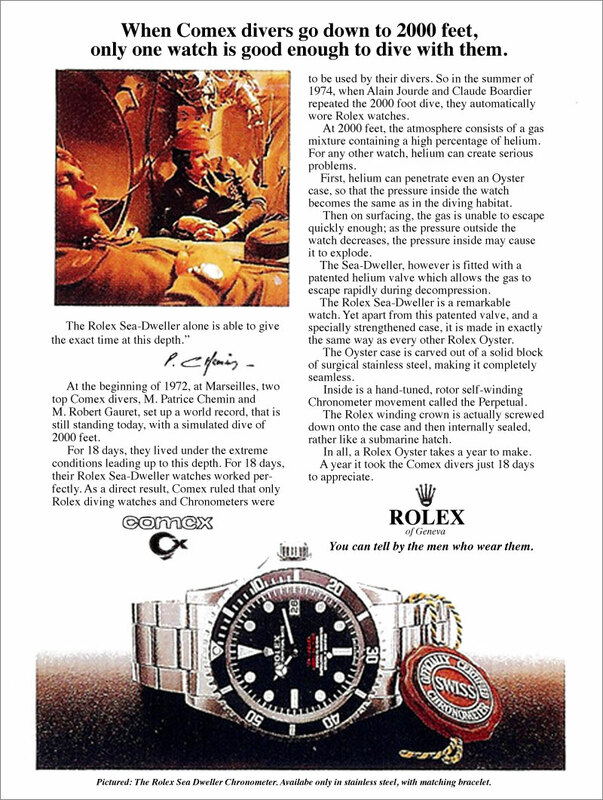 In T. Walker Lloyd's part 1 podcast interview, he tells a story about the Rolex "Hands" advertising campaign he worked on, where he worked with Telly Savalas, who played "Kojak" on TV. 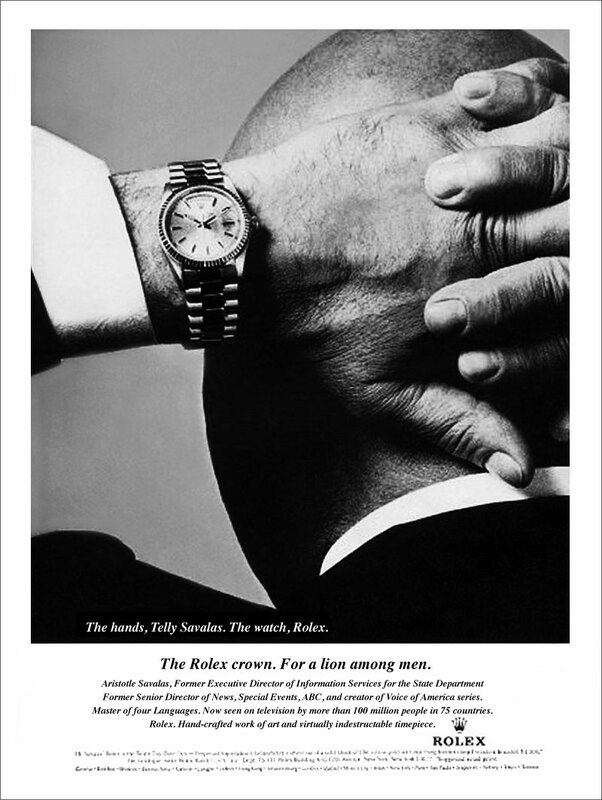 Here is the Rolex magazine advertisement from the Telly Savalas "Hands" campaign. 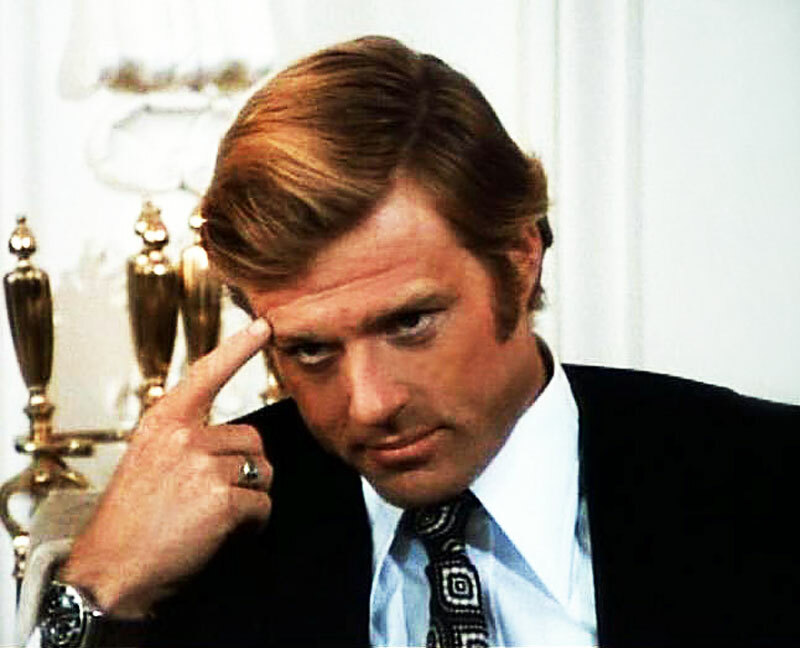 T. Walker mentioned Robert Redford wearing a Rolex in The Candidate and The Electric Horseman. 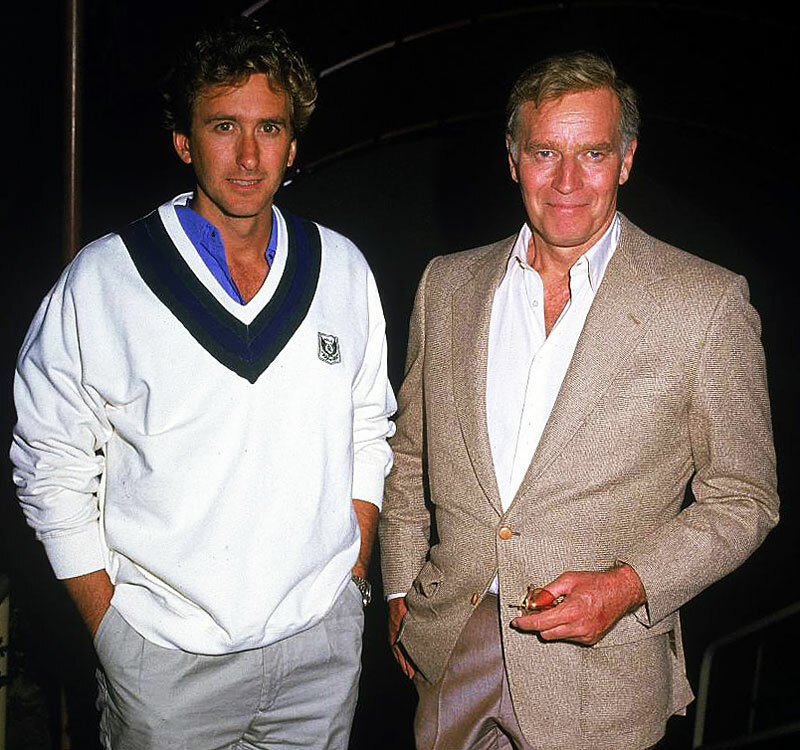 T. Walker told the story about Charlton Heston and his son who are pictured below. 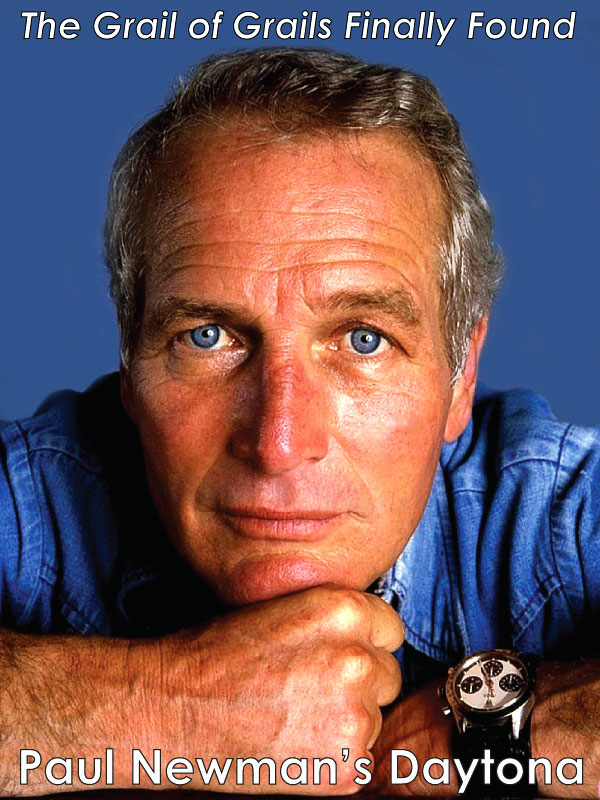 According to T. Walker, Charlton Heston appeared in a Rolex advertisement for Rolex that I have never seen. Charlton's son is pictured with him in this photo and he is wearing a two-tone Rolex Datejust. 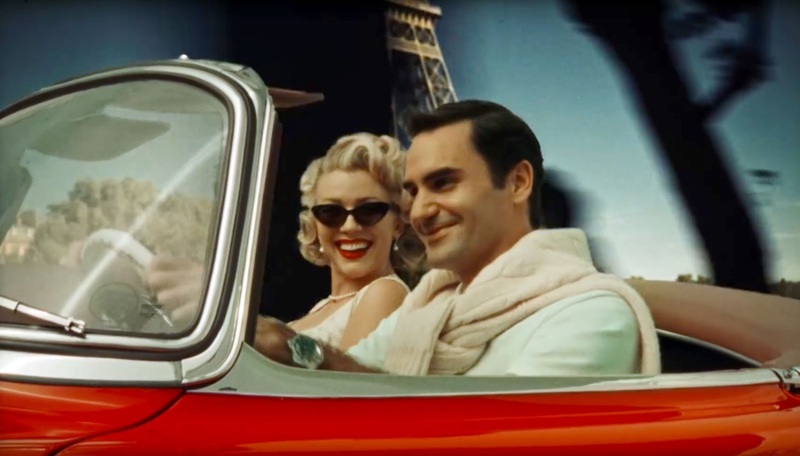 T. Walker mentioned he was on the set of Thunderball and that Rolex provided the Rolex Submariner for Sean Connery to wear. I think T. Walker misunderstood my question when I asked him what James Bond movie came first and he answered "Thunderball." 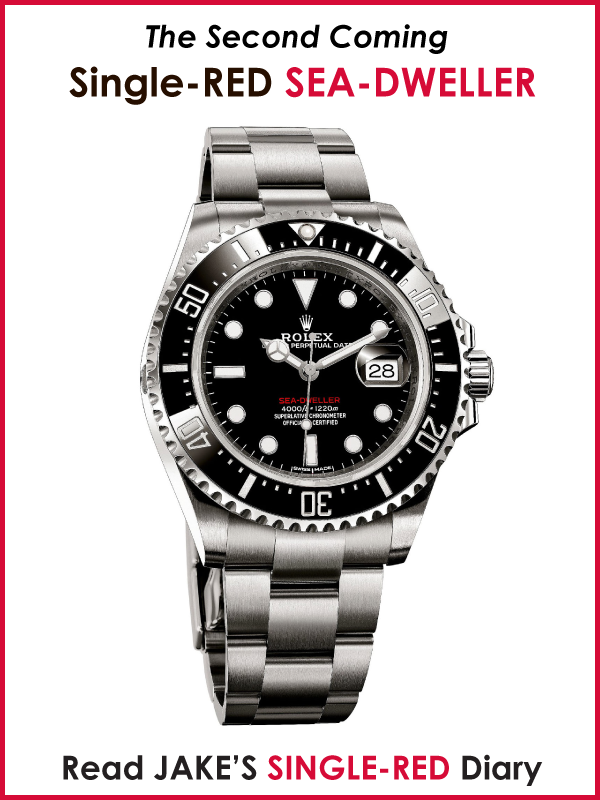 I think he meant that Thunderball was the first James Bond movie that he was on the set of as a Rolex representative. Of course, Dr. No was the first James Bond movie and Sean Connery wore his now famous Rolex Submariner. The photo below is of Sean Connery from Thunderball. 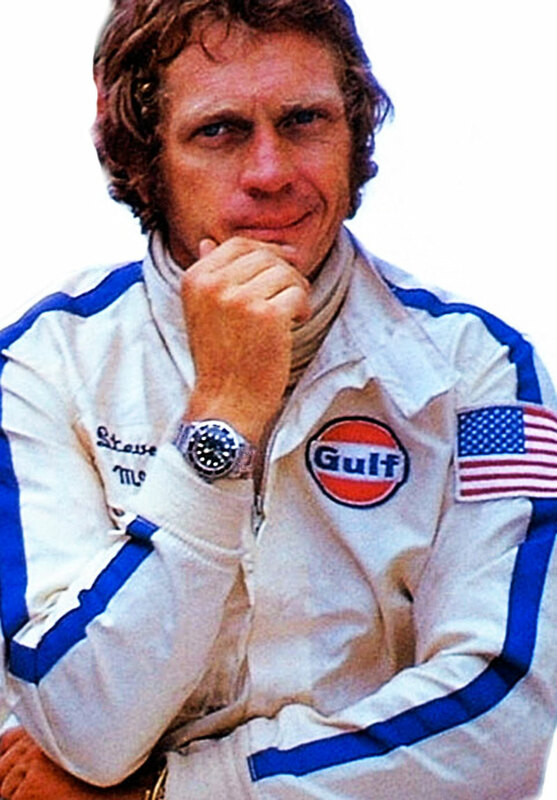 T. Walker Lloyd mentioned he gave Clint Eastwood his Rolex Root Beer GMT Master which you can see Clint wearing below. 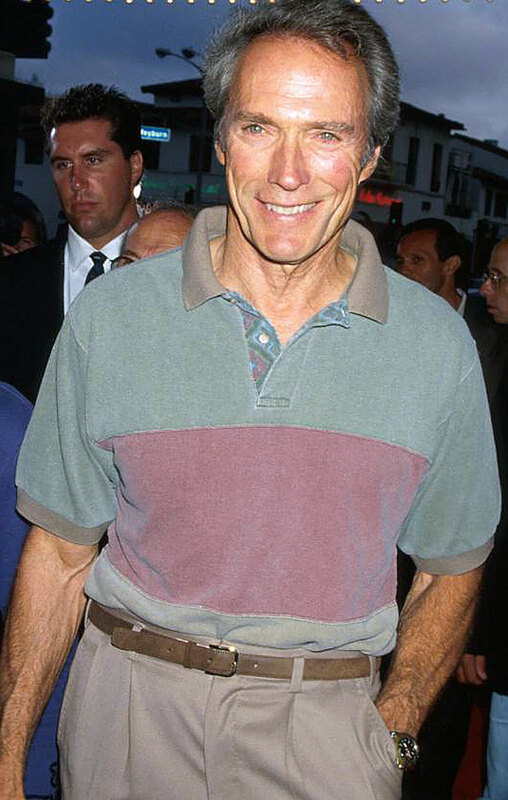 T. Walker Lloyd mentioned that actor James Brolin introduced him to Clint Eastwood. James Brolin is pictured below with his wife, Barbra Streisand, and James is wearing a yellow Gold Rolex Daytona. 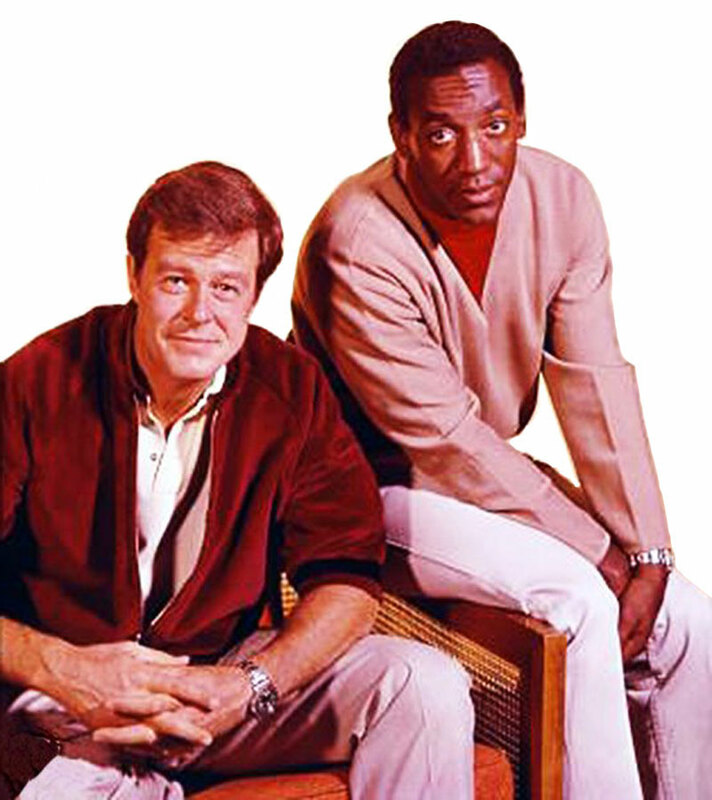 Bill Cosby and Robert Culp are pictured below wearing their Rolex GMT watches that T. Walker Lloyd gave them to wear on their TV show named I Spy. 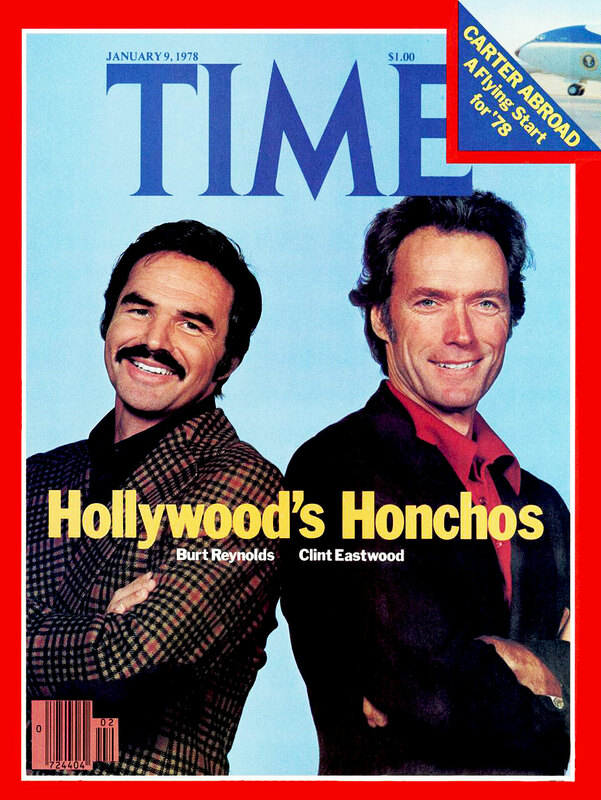 T. Walker Lloyd mentioned giving Burt Reynolds and Clint Eastwood Rolex watches. 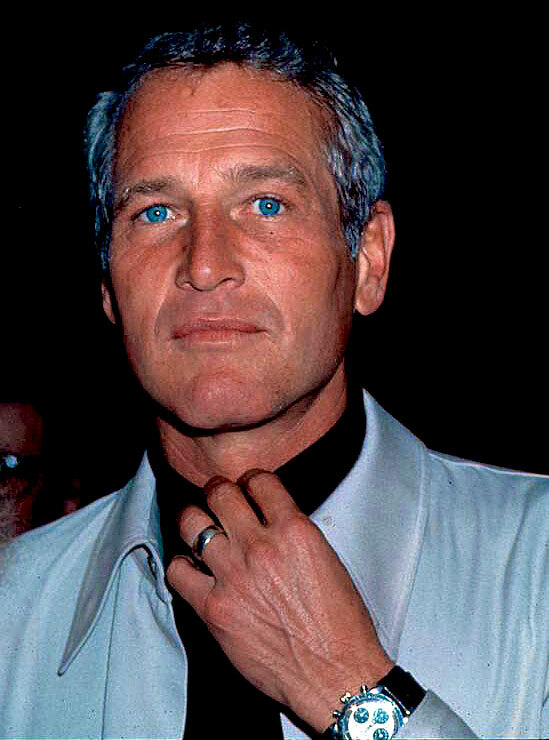 Paul Newman Wearing His Trademark Rolex Daytona. T. Walker Lloyd was very close friends with Philippe Coustea who unfortunately crashed his seaplane and died. Another one of the profound insights we gain from the T. Walker Lloyd podcast interview is how so many of the NASA Apollo Astronauts ended up wearing Rolex watches to the Moon. If you listen to the podcast T. Walker shares much of the back-story. 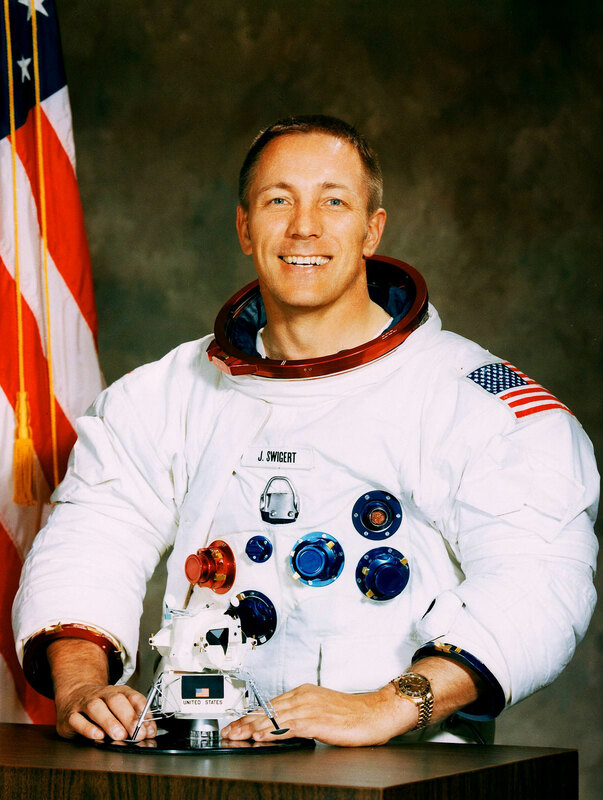 The following 3 photos are of NASA Apollo astronaut Jack Swigert who flew on Apollo 13 to the Moon. 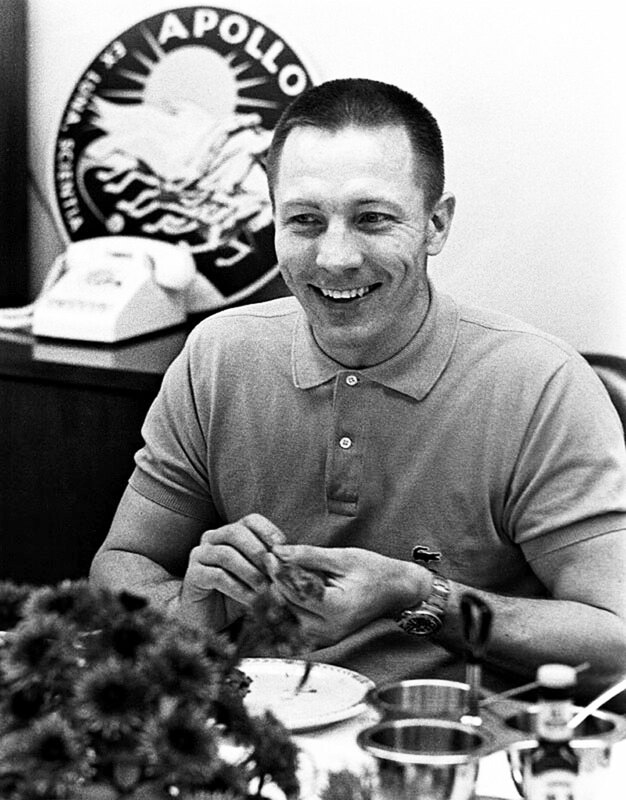 The photo below was taken at the pre-launch, steak and eggs breakfast and Swigert is wearing his Rolex GMT Pepsi. 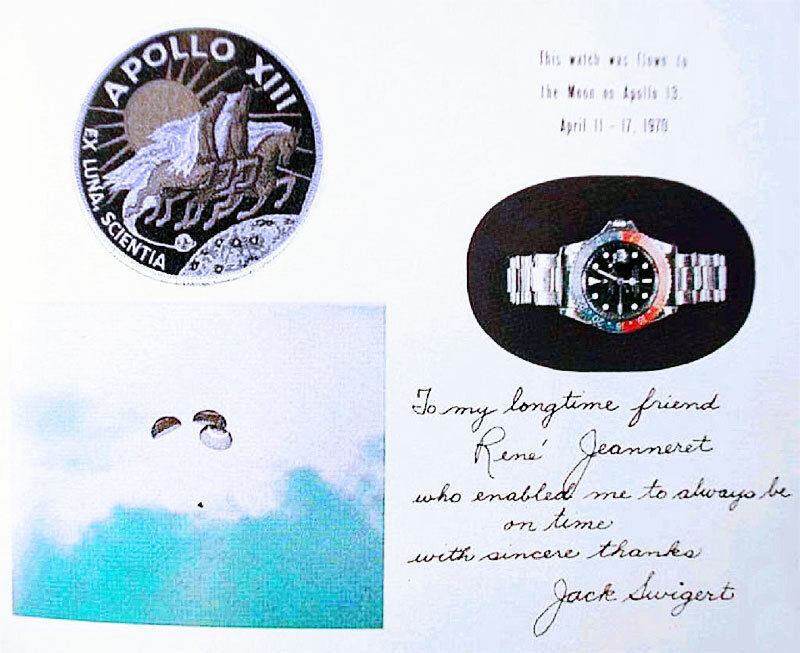 When Jack Swigert got back to earth he gave his stainless Rolex GMT to the number two man at Rolex, Rene-Paul Jeanneret. In Return for Jack Swigert's Pepsi GMT that flew to the Moon, Rolex gave Jack a yellow gold Rootbeer GMT on a Jubilee bracelet as seen below. 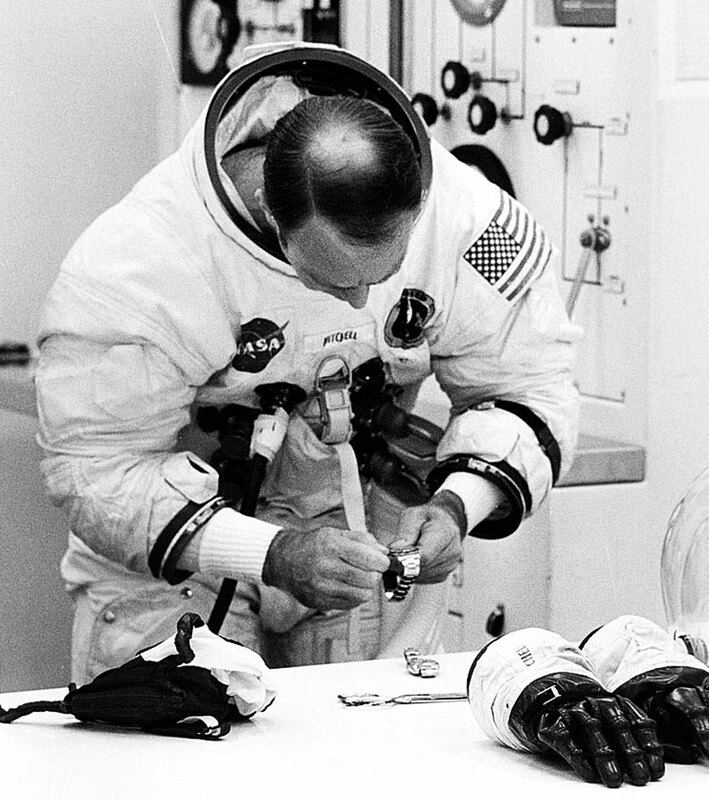 In the next image we see Apollo 14 Mission team member Dr. Edgar Mitchell preparing his two Rolex GMT Master's just before he prepares to board the Saturn Rocket to go to the Moon. Dr. Edgar Mitchell confirmed that he wore his Rolex GMT on the longest moonwalk in history. 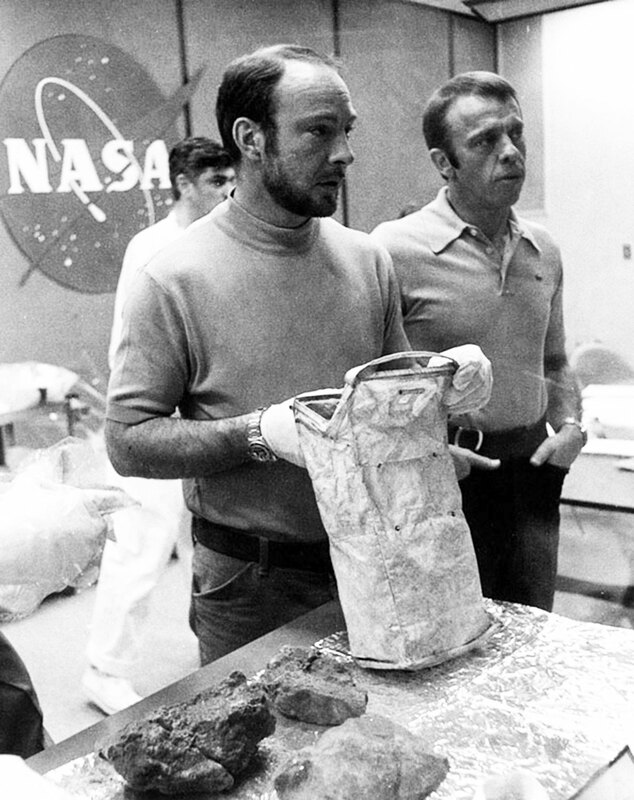 In the photo below you see Dr. Edgar Mitchell on the left side in quarantine after he got back to Earth. He is clearly wearing his Rolex GMT Master. This directly confirms that he wore his Rolex GMT Pepsi to the moon and back. 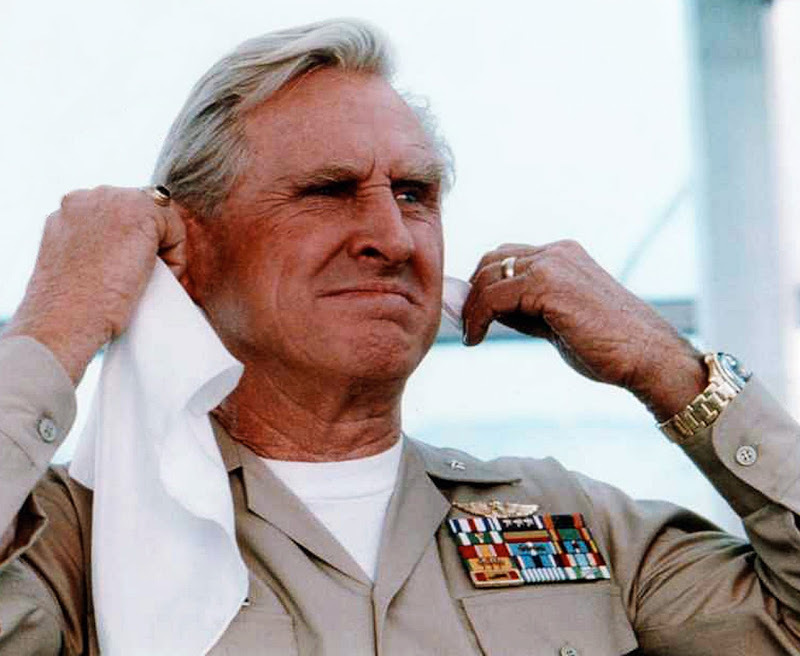 T. Walker mentioned his friendship with the famous actor, Lloyd Bridges and he told the story about how he gave Lloyd Bridges the yellow gold Rolex Submariner pictured below. T. Walker Lloyd is pictured below with Peter Benchley, the creator of Jaws. 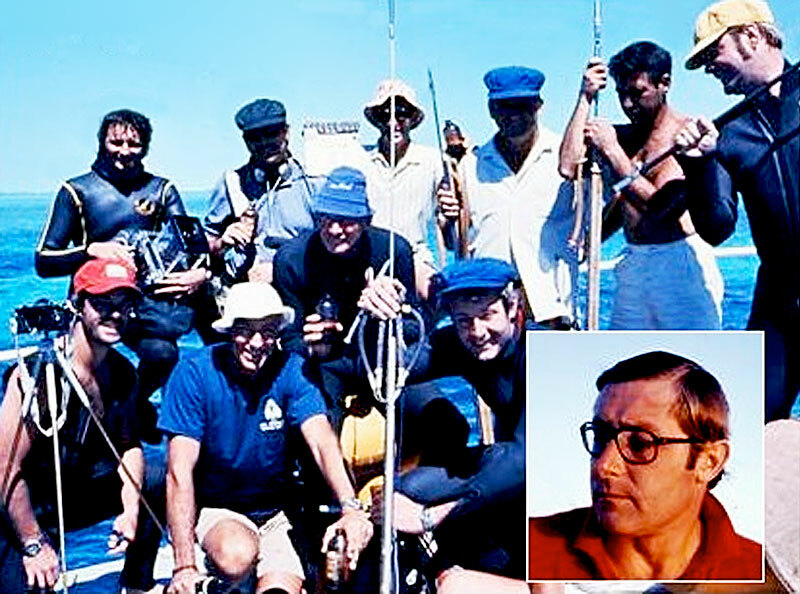 T. Walker is pictured on the far right standing up and Peter Benchley is pictured in the front row on the right side. T. Walker and Peter Benchley remained close friends until Peter died. This photo was taken several months before the major motion picture, Jaws became a blockbuster hit in 1975. 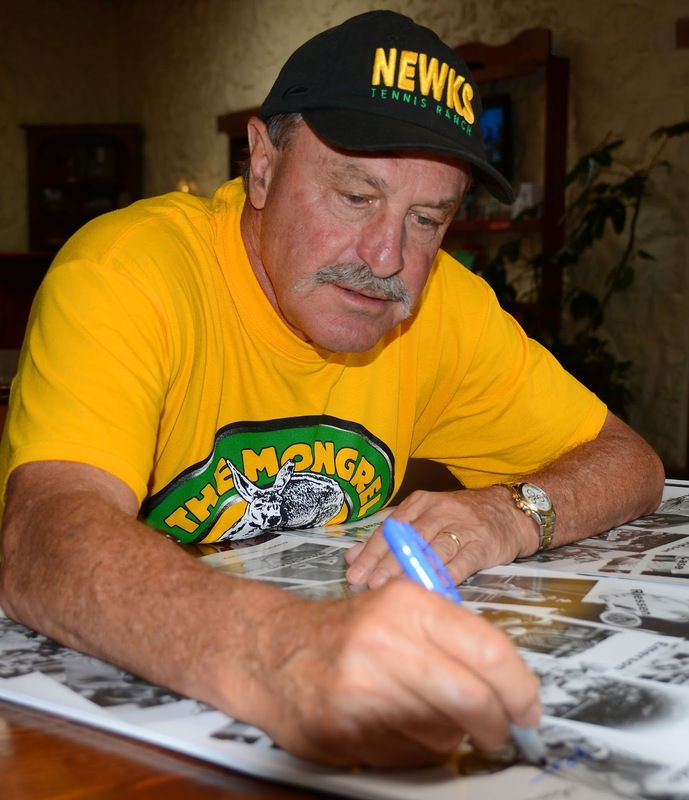 In 1975 there was an TV program named American Sportsman that had an episode shot on the Great Barrier Reef and in South Australia that featured Benchley swimming with sharks. T. Walker Lloyd was Benchley's safety diver. I remember, when I was a child, the movie JAWS was a mega-hit. I mean Huge Hit!!!! People went crazy over Jaws, which was directed by the then young Steven Spielberg. JAWS was Steven Speilberg's first real movie hit which put him on the map, and it was nominated for the Academy Awards in 1976 for Best Picture. JAWS was all the rage and remained in theaters for a few years!!! That made Peter Benchley, the author of JAWS a huge superstar. 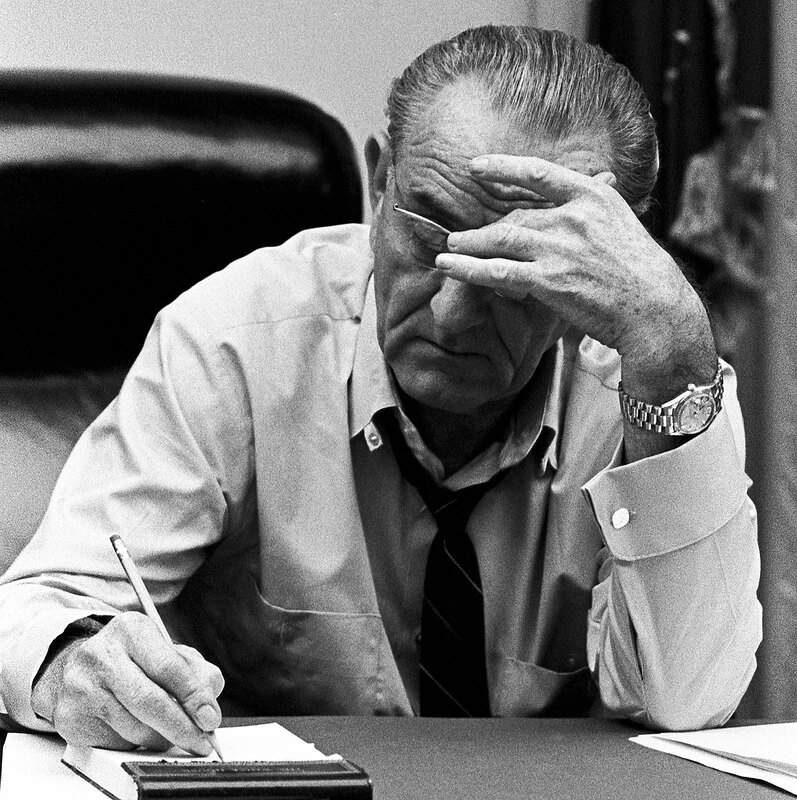 One of the most profound things we learn in the T. Walker Lloyd podcast interview is how the Rolex Day-Date got nick-named or dubbed The Rolex President. 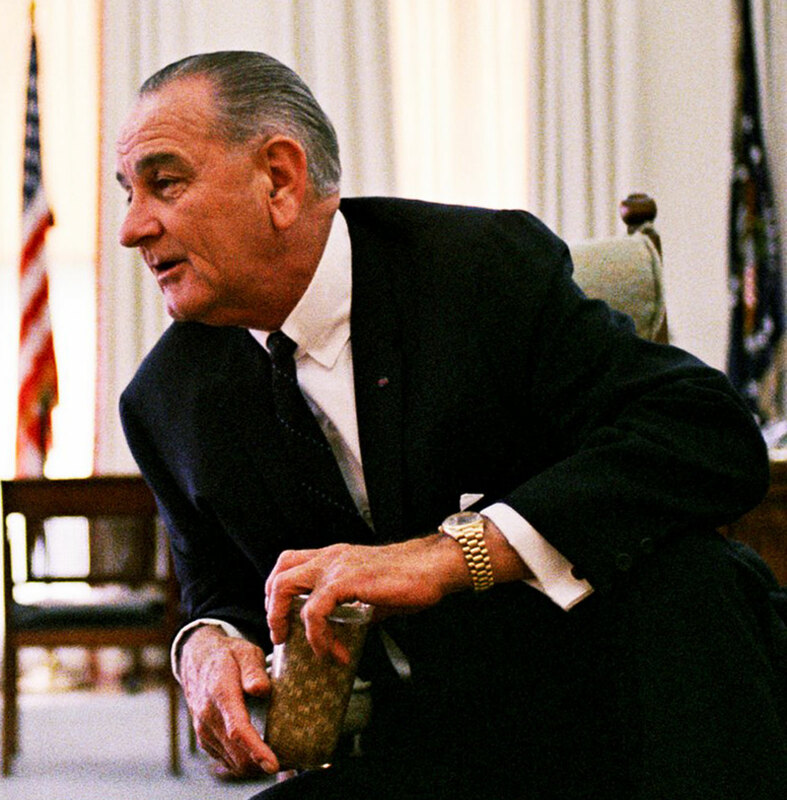 According to T. Walker Lloyd, President Lyndon Johnson named the watch The President's Watch, which turned into The President. 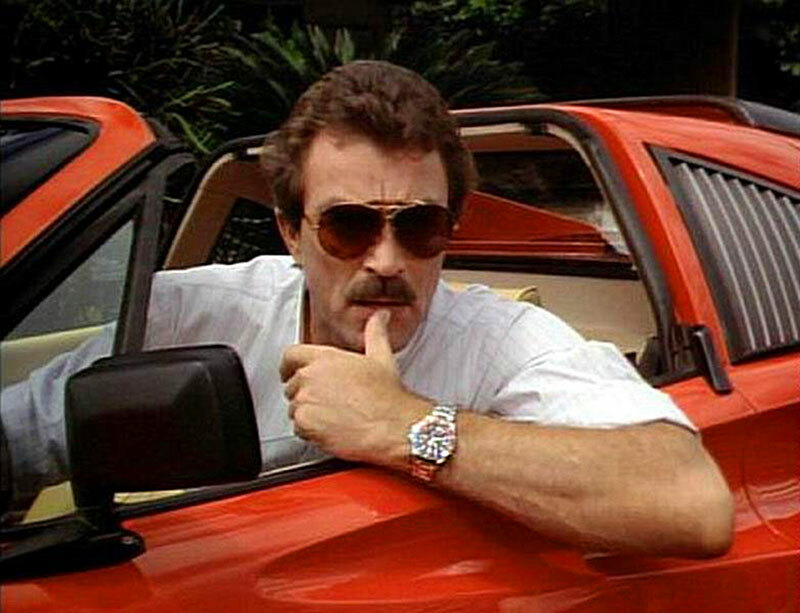 T. Walker Lloyd mentioned that he gave Tom Selleck his Rolex Watch he wore on the blockbuster TV hit Magnum P.I.